About 30 hours before this photo was taken on May 14th, the CurbCrusher gang left our beloved beagle, Dixie in Orlando to await her dog/house sitter. One of the fantastic CurbCrusher neighbors, gave us a ride to the airport, and we began our journey to the Southern Hemisphere and another continent in the evening of May 12th. We began the journey on United Airlines to Houston and then in the words of Lady CC “had to walk forever to Terminal D for Air New Zealand flight.” It was just the begining of the walking we’d do over the next two weeks. We checked in and boarded. It was a nice aircraft, a Boeing 777, we were back in economy. Good seat back entertainment lots of movies, music, and TV shows. 14+ hours of flight time. And apparently Air New Zealand has not gotten the memo about not serving food, because there was a decent dinner and breakfast served during the flight. We arrived in Auckland early in the morning (it was now May 14th around 5:30am) and parked at a hard stand and took a bus to terminal. Once in the Terminal, we headed for the international transfer lounge, and had to pass through security again. We then boarded (A320) another Air New Zealand flight, exhausted, but with still 3 hrs of flying left. The seat back entertainment still good as was the crew, and Air New Zealand fed us again. Finally we arrived in Sydney, Australia around 8:30am on the 14th of May. Immigration and customs were fairly easy to get through. With a US passport, we were able to use the automated kiosk and photo taking line for immigration, and with nothing to declare we walked right through customs and bio-security. We then got some Australian Dollars at an ATM and got in the taxi line for a ride toward our lodgings. For the first time ever, we used Airbnb. We selected an apartment located in the Wolloomooloo section of Sydney right next to Hyde Park and the Australia Museum the on corner of William + College Street. Our host, Michael showed us around, how to get in and out of the building, and filled us in on some local attractions and activities and left. We then took showers and rested until a bit after noon. After finding lunch in an Italian café on nearby Stanley Street, we walked through Hyde Park to Mrs. MacQuerries chair (a stone carving) and the Botanical Gardens. From there we walked to the opera house and got our tour tickets for the next day that we had been unable to print before leaving Orlando. We bought a Christmas ornament and pen+ink drawing of the opera house. 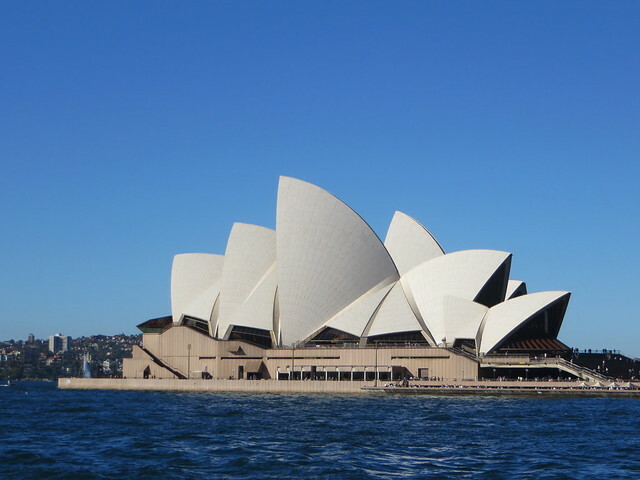 We walked around outside Opera House and then through Circular Quay toward the Harbor Bridge. 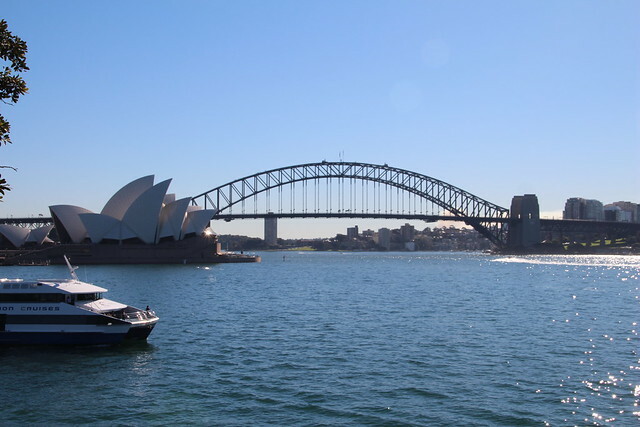 We were in search of the Sydney Bridge Climb offices and so that we would know where to head the next morning. During the walk we took lots of pictures of the opera house and Bridge. For the most part it was a comfortable day, it got warmer (75F) in the afternoon. We eventually bought drinks and walked back through Botanical Gardens to our Airbnb. Everyone was hungry, but tired so we headed our early in search of dinner. We found another Italian Restaurant named Trovata (very good food!) just down Stanley from our lunch location to have dinner. We ate early (5pm) for here but we were so tired. We then went in search of the Woolworth that Michael had told us about. We walked a couple of blocks past were he’d said, but did not see a Wooolworth’s sine. Finally saw a shop titled “Metro” and went in there. It appears that Woolworth is re-branding it’s city center grocery stores. So we went grocery shopping, headed back to the apartment and went to bed. 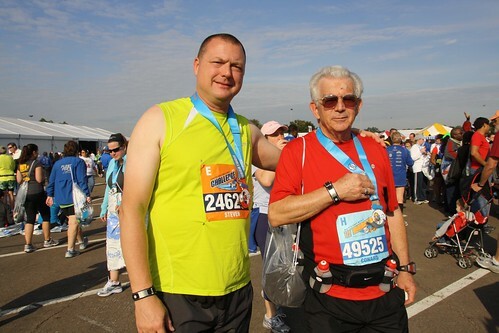 This all came about in June of 2015, my Dad and his brother, lets call him Uncle Curbcrusher, decided that they wanted to do a race where they would get belt buckles instead of medals. Uncle CC found the Iron Horse Endurance Race scheduled for Febr 6, 2016 in Florahome, Florida. They gathered to look at the course, and since it was only about two hours from the house, I made the mistake of meeting them for lunch. With a little bit of persuasion on the part of these two septuagenarians pointing out that this was during the Florida dry season, it would be cool and the course is mostly double track and flat I was convinced to join the endeavor, and the next thing I knew I was training for a 100K race. Before talking about the race, it is important to talk a bit about the course. The run takes place on a paved rails-to-trails bike path and on forest service roads inside the Etoniah Creek State Forest. From the start-finish line in Florahome, Fl the runners head west on the rails-to-trails bike path to the town of Grandin 1.75 miles away and turn around and head back to the start-finish. I referred to this as the mini-loop in my pre-race visualization, and in during race thoughts. The course then continues approximately 2 miles east to the packed dirt Holloway Road. The course then deviates about 50 yards north onto a double track that runs next to the power lines. After approximately 2 miles under the power lines, the course reaches aid station 2 which is at the intersection of 2 roads imaginatively named East V Road and West V Road. This is also the entrance to the primitive camping area for the forest. The course travels 2 miles up the East V Road to a split that starts approximately a 4 mile loop through Green and Red camps and then back to the split, and then 2 miles back to the intersection of the East and West V Roads, for a total of 13.5 miles at this point. Th course then travels approximately 3.75 miles up the West V Road and Fieldhouse Road to aid station 3 located at the official entrance to the state forest, then back to the intersection for a total of 21 miles. The course then traces the power lines and the rails-to-trail bike path back to the start-finish line for a full loop of 25 miles. For the 100K, you do this loop twice, and then start a third loop, but turn around about 3 tenths of a mile up the East V road. The race got underway at 7:00 am Saturday, and would continue to 11:00am Saturday. Temperatures were in the mid 40’s with a slight wind and overcast skies. I was dressed in a long sleeve running shirt, long compression pants and shorts, carrying a Osprey Rev 1.5 backpack. I started with the attitude that I should be able walk 3 miles and hour and finish the race. However, I really wanted to be done by midnight, which would be about a 16:45 pace. My race plan was to run 1 minute, walk for 4 until I couldn’t keep my heart rate under 65% of max during the run. Then I would switch to a 30 second run followed by a 2 minute walk until the same HR condition was met. I was hoping that would get me through the first 25 mile lap, and after that I was willing to walk the rest of way. The mini-loop (3.75 miles to Grandin and back) went well. Uncle CC and a friend (let’s nickname him Boom-Boom) of his (running a 1/1) were about 5-8 minutes ahead of me, and Dad was about 10 minutes behind. I managed less than a 14 min pace through the end of the rails-to-trails path at about 5.5 miles. The power-line double track slowed me down. There were areas where is was sandy, not bad sugar sand, but enough to slow you down, and then an area were water covered the path and you had go into the woods to go all the way around, or jump from soggy area to soggy area over a 2 foot wide puddle. Aid station 2 arrived at mile 7.5 with no real problem. Entering the state forest, the East V Road was easy to run on for the most part. It had rained hard (3+ inches according to the race organizers). Running in the tracks and dodging the puddles took a bit of a toll on my HR, but I was staying in range, and my pace dropped into the mid 14’s. At mile 10, I pulled the PB&J out that was in my backpack and had my first meal break, and munched on some M&Ms too. I was fairly happy with the way it was turning out. The course was fairly flat and except for being a bit muddy, it was fairly easy terrain. After completing the East V Road, I started up the West V Road. This road was more of a road than the East V Road, meaning that there were less two tire tracks on this road and more of a 8 – 10 foot wide graded surface that was worn where tires went over it. There was more elevation on this road, and my HR started creeping up in the run. I switched to the :30/2 interval, but my HR was still approaching the 65% limit I’d set in the run portion. I switched it up to a :20/2:10 interval, and that kept the HR where I wanted, but dropped the pace to about a 15:30 or so. As I reached the aid station 3 turn around, Uncle CC and Boom-Boom were just leaving. I stopped and picked up a fresh PB&J sandwich for the back pack to replace the one eaten at 10 miles, use the ranger station’s toilet and clean out the sand and crap that had collected in my shoes, a fairly long stop. About a mile out of aid station 3 I ran into Dad headed in, which meant that he was about 15 minutes behind me. On this leg, I ate the PB&J I had picked up at the aid station around mile 20. The run back to the intersection was uneventful. Headed back to finish the first loop, I kept the :20/2:10 interval until the end of the power line track, and the switched back to a :30/2:00 once on the pavement of the rail-to-trail bike path. I reached the start-finish line at about 6:22, which is a bit over 15 min mile pace, but considering that included the two stops at aid station 2 and one at aid station 3, I was happy with the way it was turning out. The volunteers at the start-finish aid station helped me fill my water bladder in my backpack, grab a snack and get going. After completing the second mini-loop, I stopped at the car and reloaded the backpack with a PB&J sandwich and some more M&Ms. When I arrived back after the mini-loop, Uncle CC and Boom-Boom were changing shoes and reloading provisions. As I started the second loop headed toward aid station 2, I was feeling a little tired, but in good shape. I kept the :30/2 interval going until the pavement ended and managed some more less than 15 minute miles. Once I hit the power line road, I switched back to a :20/2:10 interval, and instead of running for the :20, did a fast walk. I also ate my 30 mile PB&J sandwich. This resulted in my pace dropping to about 16, but it was comfortable and I figured comfortable was what I wanted for the next 30 miles. Much like the whole day, it was overcast and gloomy as I was leaving aid station 2 on East V Road for the second time. I was about 8.5 hours into the race, 3:30 in the afternoon. From what I was told it didn’t get above 41 (weather history here), but I was warm and cozy. A little more than half way around the East V Road loop it started raining. As I remember it was about 9.5 hours into the race and it didn’t make me cold, it was just an inconvenience. I was glad that I was getting off of East V Road though, as it had the most standing water on it from the rain two days earlier, and I figured as the rain continued, it would get worse. I had a driving goal of trying to get to aid station 3 before it got so dark I needed a headlamp, and I was keeping my pace under 17 min/mile just walking. All in all things were looking very promising. During my stop at aid station 2 I saw Dad. This put him about six miles behind me. At my pace that was about 95 – 100 minutes, not sure where it was at his pace. I headed up West V Road, the mission to get to the aid station by dark. West V Road in the rain was different. My Pace slowed some more and my times dropped to over 17 min/mile. I hit the aid station right at the last light was fading. I got my drop bag and got the big head lamp out (I had been carrying my small head lamp) and another PB&J sandwich. At 42 miles in, I was 20 from the finish and it was finally dark. A volunteer thought I looked cold and got me a cup of warm broth, for which I was very thankful. Looking back, I probably should have had two. Leaving aid station 3 as I was wolfing down the PB&J I saw Uncle CC and Boom-Boom. They were about 5 minutes behind me, and had missed Dad at aid station 2. The whole West V Road I didn’t see Dad, so I was a bit concerned. West V in the dark, and the rain was a different animal. I learned that a headlight in the dark is not really useful for avoiding puddles. In the daylight, you can see puddles and try and miss them. Even with a headlight on, you’d see the puddle right before you foot sunk into it. In addition, I spent so much time with my head down that my neck was hurting after about 2 miles. In addition, it was starting to get cold and my pace was slowing as I did a couple of miles close to 19 minutes. At aid station 2 I stopped and spent about five minutes at a burn barrel. A volunteer was kind enough to bring me some broth and water again, and I warmed up and go ready to head for the start-finish line. The power line track in the dark was worse. I was slowing down quite a bit, and the water was deep in ruts on it so my feet were staying wet. In addition, my Garmin decided then was the time to drain the battery, so my GPS race ends at a 47.16 miles, 12 hours and 46 minutes at a 16:15 pace for the day. The course heads west from aid station 2 along the power line road and the rails-to-trails bike trail, and the wind was coming fairly constant from the WNW. That meant a cold wind and rain in your face the whole way. As I approached the start-finish line, 50 miles into the race, I was mentally preparing to do the 12 mile loop needed to finish the 100K. I wanted to stop and put on a dry shirt, and grab a windbreaker and a hat, along with another PB&J sandwich. When I dropped the backpack so that I could get the wet shirt off, I started shivering uncontrollably. I finally got a dry shirt and jacked on, but was still shivering. I left my headlamp and hat and ran over to a burn barrel. I stood at the burn barrel 5-10 minutes until I felt warm and then headed back to gear up with a headlamp and hat for the final loop. As soon as I got out of the radiant heat of the burn barrel and the wind hit me, I started shivering again and couldn’t stop. At this point I decided the that my body was vetoing my minds decision to continue. I made my way to the start finish line and “downgraded” to the 50 miler. I got a 50 mile medal, not the 100K belt buckle that I’d hoped for, but I was going to get warm. My official time 14 hours and 4 minutes. I headed back to the car, turned it on and maxed the heat. I grabbed a blanket I had in the car and huddled under it. It took about 15 minutes before I quit shaking enough to start texting folks. I found out that Dad got picked up on the course at 36 miles. He had taken and hour to cover mile 36, and was having trouble walking. He made the smart decision and asked for help. The kind folks from aid station 2 came out and picked him and brought him back to the start-finish. He told me when he was telling them on the ride that he hated to DNF, one of the guys told him that DNF also stood for “Do No Fatality.” Maybe not grammatically correct, but a true statement there’s no reason to die for the race. Uncle CC was about 10 minutes behind me at the 50 mile mark. He and Boom-Boom ran the mini-loop, before Uncle CC decided that the conditions were miserable enough (he claims there were snow flurries) that he would downgrade to the 50 miles also. Boom-Boom kept going. It took him a bit over 6 hours to cover the last 8 miles of the 100K course. Of the four of us that started, he was the only one to do 100K. But he said he didn’t get warm for over 3 hours after it was over. I’ve run a bunch over the past 5 – 6 years with my Dad and Uncle CC. Dad is 74 and his brother is 70. They talked me into trying the 100K with them and I’m proud to have run with them, but about 2200 on Saturday the 6th, I was really questioning whether age brings wisdom. After warming up, my feet were a bit sore and swollen the next day, and had a couple of new blisters, but overall a good nights sleep and I felt pretty good. Drove to Fort Lauderdale (FLL) at 9 am. It was overcast and rainy. We arrived to the port around 1230 pm. Nicer terminal leaving from Pier 21. We were late leaving because of the loading of food. We dropped our bags and met Jeffrey, our cabin steward from the Philippines. We told him about our beds, robes, mattress pads, and ice. Went to the buffet since it was after 2 pm by the time we ate. Steve and KIP went to register her for the teen club (yeah there’s teens on board-due to it being Holy week!). I went to unpack and organize. We had muster in the Princess Theater. Then went to Bayou to get a reservation for Monday after Easter for KIP’s birthday. 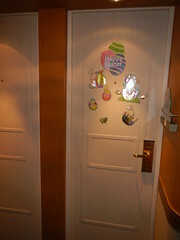 Then we dropped our life jackets back off in the room and decorated our door for Easter. Went back to deck 7 to get more maps of ship, get our future cruise credits and Ruby pins. Looked at the shops. Came back to change clothes, eat dessert at Horizon. Then on to comedian Scott Wyler’s show, then to Explorers lounge for trivia. We got 17 out of 24 correct for 3rd place. Back to room to download pics, see tomorrow’s Patter and go to hot tub. Found out hot tubs close at 10 pm so no hot tub or ice cream tonight. Didn’t sleep last night. The walls in the cabin creak. It sounds like styrofoam rubbing up against itself. Started the day off with a nice breakfast in the Horizon Court. 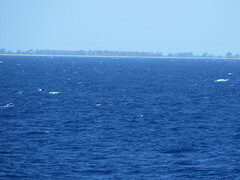 Saw small islands off the side of the ship. We looked like we were sailing right into a storm but it disappeared. Weather was great today. Very windy on the decks. Then went to Explore Ashore which was a talk about port excursions with pictures. KIP went to the Team Trivia challenge in the Explorer Lounge. Her team scored 17 tying again. Then they lost the tie breaker. Walked around until the Cruise Critic gathering at 11 am in the Wheelhouse Bar. Some officers and crew came and introduced themselves and told us about our destinations. After that we ran down to the Art 101 talk but didn’t stay too long. Kip was studying in the library. She has AP tests when we get back. We then had lunch in Sabatini’s with personal pizzas, they were just as good as the Island Princess’. Then KIP and I came back to nap and Steve went to the port talk with Chris Robert’s who is the guest lecturer on this sailing. He stayed for the Panama Canal video which he said he fell asleep in. I woke up and walked around and saw them getting ready for Pictionary in Crooners. Eventually I went to tea in the Provence Dining Room with a table full of Canadians until KIP showed up. KIP and I went to get a frappaccino afterwards with our coffee card. Then I went back to the room washed my hair and got ready for formal portraits. We were able to get to about 7 stations for pictures. Then we changed into casual clothes and went to HC for dinner. KIP went to Teen Club but they were at dinner so she ate with the counselors. Then went back with them. I changed and went to the hot tub with Steve (he didn’t get in). KIP came along and got ice cream and sat with me in the hot tub. We were in the solarium by ourselves. Steve left to go to learn how to play craps. I came back to journal and get comfy in bed. Got an invitation to the Captain’s Circle exclusive. We might go because there is a drawing for Elite status for this trip. I watched Chris Robert’s on the stateroom’s TV about the ports. Not too much to do today. Basically just relaxing. Watched the Wake Show and had room service breakfast delivered. Steve went to a photography class then to the casino. I went and checked out the$10 sale and KIP went and studied. KIP and I did the Chicken Little Hunt but we only found ½ of the20 chicks that were hidden. They gave us 30 minutes to look on 3 floors to find the eggs with chickens painted on them. Prizes were chocolate bunnies. The pastry chef did a lot of chocolate eggs and they have them displayed in the atrium and at the buffet. I took several pics and a movie. Steve went to the Panama talk and KIP and I did the morning trivia in the Wheelhouse. Afterwards we all met up in Sabitini’s for pizza again. I wanted to see the art auction but instead I went up to the Lotus Pool deck to read then back to the cabin to nap. KIP went to the teen area to make a backpack. I went to the portrait raffle but didn’t win anything. There will be another after the next formal night. Then at 4 pm we went to the Captain’s Circle talk in the Princess Theater. They introduced the band, singers and dancers. Then drew for champagne and Elite treatment for the rest of the cruise. We didn’t win. But we got 2 free drink coupons at the exit. Then we went to afternoon trivia in the wheelhouse again with KIP. Then on to casual portraits on deck 6 and to the buffet in HC. Then made our way to the Universe Lounge for 50-60’s trivia. Afterwards we went to the hot tub and got ice cream. 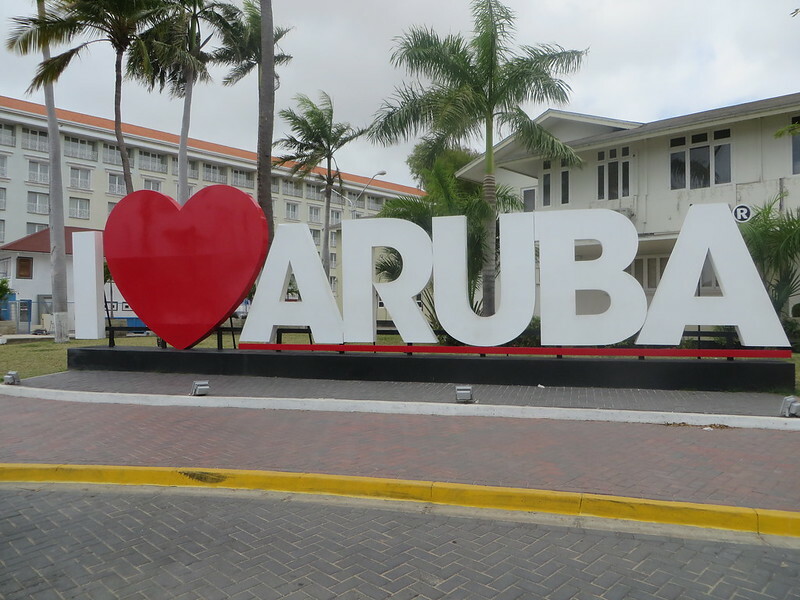 Woke up at 630 am to get ready for Aruba. Went on the balcony to look out and get ready for breakfast. After breakfast in the HC we went to the secret deck with the binoculars to get a view of the town. We docked right at 8 am. We got off and walked into the terminal to look for Ivan. He was waiting for us right next to the door with a sign with my name on it. We went to his van and started our tour at the Colorado Lighthouse at the south side of the island. 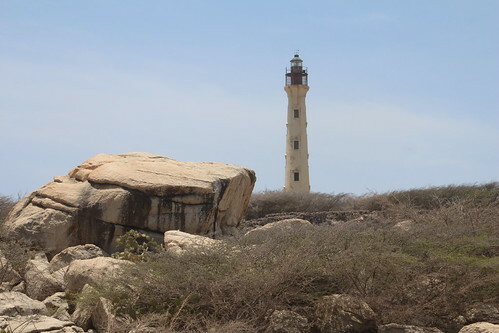 It’s more of a navigational aid than a pretty lighthouse. On the way we saw goats and the town of Oranjestad, we passed an oil refinery and Queen Beatrix airport. 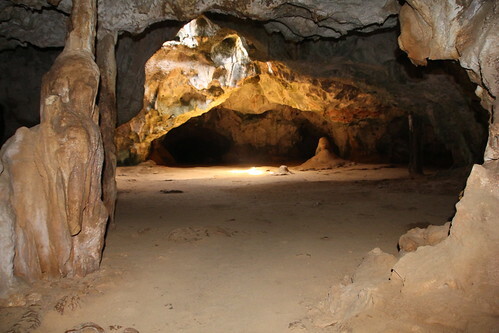 Then we went to Arikok National Park (entrance fee $24 for 3 people) and went into a cave that has bats in it. Ivan was telling us about the rattlesnakes and boa constrictors. When we got to the visitor’s center for a bathroom break we looked at the snakes and some lizards. He told us why they put a bounty of $10 for each live boa constrictor turned in and they hunt them 3 times a year. We stopped and looked at the windmills. 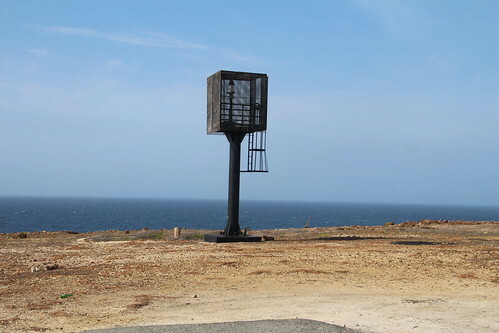 Companies want to put up more because the island is very windy but it is a political fight where they will go and what company will run them. 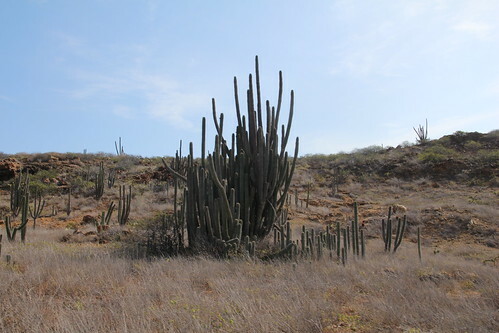 We have all been surprised at how dry Aruba is. It looks a lot like Arizona or New Mexico with the hills and cactus .Also a lot of sand and rocks. 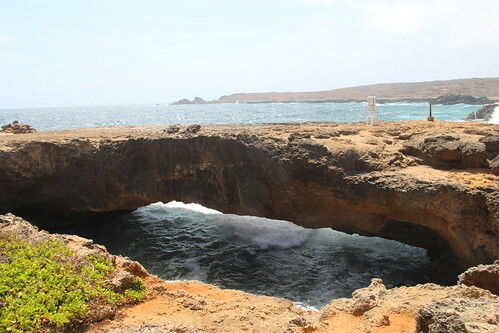 After leaving the National Park we headed to the Baby Natural Bridge which is right next to the larger one that collapsed. Ivan told us there are 5 more natural bridges but they are hard to get to and one needs a 4 wheel drive vehicle. We saw the blue spotted lizards from the cages at the National Park so we got some pics of them. From there we went to the Ayo Rock Formations and saw the petroglyph. We could not climb these rocks they are too steep. 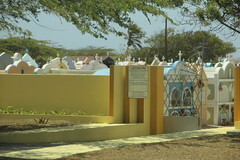 We drove to the gold mine area and he told us a story about a company that wanted to mine but the Aruba government wanted ½ so they said no. Then on to the California Lighthouse and the mass of people there. Lots of buses. Took our pics and then drove by the Casiban Rock formations but we didn’t get out to climb them. We also drove by the donkey sanctuary, butterfly farm, and all the big beaches. It’s Holy Week so people come down to the beach to camp all week. They set up their tents and live on the beach and enjoy the Spring. We also passed a graveyard right across form Ivan’s house. They paint your crypt the same color as your house so they match. So it was a very colorful graveyard. After the tour was over we got back on the ship and had lunch at Sabatini’s again then went out to walk along the main street. We stopped at the Renaissance Hotel at Starbucks to check our email (We asked Jeffery our cabin steward where to find free or cheap wifi in all the ports we stopped. ), and then came back to the ship. Most stores weren’t open today with it being Easter so no real shopping to do here. KIP and I took naps and Steve went to read in the Lotus Solarium. Then we went to the Lotus hot tub and KIP went to check out the teen area. Then went up for lemonade in the HC. I was parched so I drank 2 glasses. We looked at our photos before we went to see the Illusionist Alexander the Great. It was OK I think he was on another ship because I have seen this very act before. I came back to the cabin to get a shower and watch World News. Then I went to Easter trivia with KIP. Steve showed up later. We all won Princess pens for answering questions about Easter. Then we stayed for Princess Pyramid and Steve and KIP got 4 right. But the winning team had 13 right. Came back to the room and Jeffrey stopped us to give KIP some Peeps and show us pics of his new baby who is 4 months old named Mandela. He has not seen her yet. He will be leaving after this cruise to go home to his wife and daughter. Watched wake Show and found out we won. Went to library to put in today’s answer. KIP and I went to morning trivia and Steve went to the port talk on Costa Rica. Afterwards I went to work out in the gym and grab an iced coffee and walk 3 times around the deck. Saw flying fish on the starboard side. No rocking or squeaking from the cabin last night. KIP went to study. We weren’t eating lunch today because we booked the Bayou Cafe for KIP’s birthday dinner tonight ($25 pp). Steve did go into the main dining room for a hamburger and fries. We then came back to the cabin to relax and read /watch TV. At 2 pm I went to the Ammolite presentation in Facets, then onto the Scattergories game in Crooners. Fun game but not in that venue, too hard to hear. Host Debbie needed a microphone but didn’t have one. I gave up after 1 round and went to the emeralds presentation at 3 pm in the Wheelhouse. We didn’t win any of the raffles but I did guess which one was the fake emerald and was real close to the real price of one of the pieces. We then went up to the HC to get iced tea, lemonade and fries. Then onto afternoon trivia in the wheelhouse. Then KIP and I decided to dress up for dinner and also get our pics made. After pics we went to dinner at the Bayou, which was good. We had sausage and grits, salad, jambalaya, mud dog bisque. Then Steve had a NY strip steak, I had filet mignon, and KIP had catfish. Then with the entre they serve all the sides together, family style. They had fried green tomatoes, dirty rice, and succotash. Then we had all the desserts along with a birthday cake for KIP. The staff sang to her and embarrassed her. We missed the evening performance because we were at dinner and instead played Guess that Song trivia. We didn’t score too well. Then we were off to bed, we have to set our clocks back tonight. We won Wake Show trivia again the prize is some casino card. We changed time back today, so supposedly we have an extra hour of sleep. Not for me- my stomach was upset from all the rich food from last night. I got up at 615 am and we were already sailing into the port. There were so many high rises, and the port was really hazy. We saw a small lighthouse and a fort across form each other. Our prize from the Wake Show came in our mailbox-we got a casino voucher for a chance at the grabber claw machine. We had breakfast and then got ready to go ashore to meet Claudia, our guide for today. 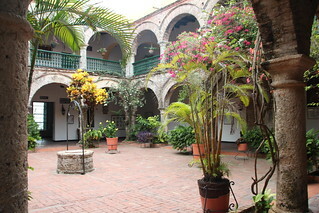 Cartagena has a pretty walk through terminal with animals and exotic plants. We actually walked far enough that we came to the working docks. We met Claudia and her driver, Pilar, who was awesome at navigating the horrible traffic. There were so many motorcycles as they are considered taxis here taking people into downtown and they weave and bob all through the traffic. We first stopped at La Popa Monastery of Our Lady of the Candle. It has an unbelievable view form the highest hill. We walked through the chapel and center of the monastery and saw the altar. 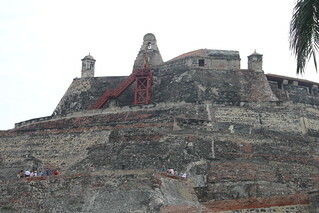 We then drove to San Felipe de Barajas Fortress. We did not enter but took several pics of the fort from outside. Claudia told us it looks much like St Augustine’s fort. The vendors weren’t too bad if I said no they left me alone. Then we drove through the Old City walls. We decided not to stop for shopping at Las Bovedas. 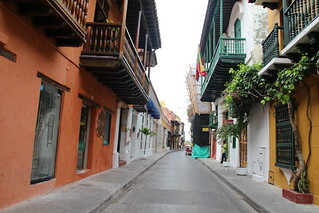 Then we traveled to an area where we got out of the van and walked into the Old City. Claudia explained the architecture and the ½ floors and showed us several examples of private homes turned into hotels. We walked by a cathedral, the Inquisition Palace, Bolivars Plaza, and Customs Plaza. We ended up at the Sanctuary of Saint Claver. Afterward I bought 3 bags of coffee from a street vendor. 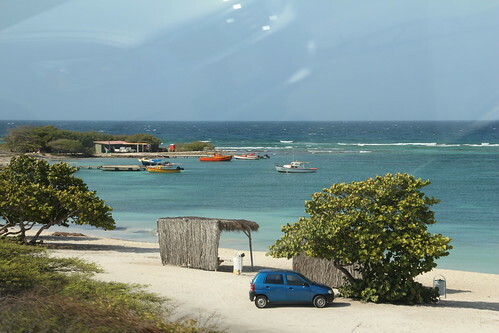 Then we walked back to the van and drove into the new city and beaches. We stopped at the Joyeria Caribe Emerald Museum and factory. 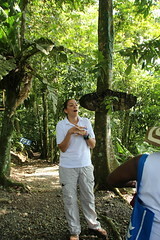 Our guide Jaime, took us around and showed how they mined the emeralds from the Earth. Then we saw many beautiful examples of cut gems. I liked one emerald cut 1.99 carat for $1400 but I resisted. We had a drink while we were there as well. Then Claudia took us back to the terminal and we walked back through the animals to get to the ship. We dropped our stuff in the cabin and went to Sabitini’s for lunch. Then KIP and I napped before sail away. At sail away we went to the private deck up front and got pictures at 2 pm. Then I napped again until 3 pm when I went down to check on our pictures and another $10 sale. At 4 pm was the afternoon trivia which we finally won 17/20. Then I went back up to the HC for chips and salsa and sat and talked for awhile. Today we had breakfast in the cabin as we came to the canal. We ate, then moved to the open deck on deck 10 in the front. We moved around as we were going through the locks to get the best views. I spotted a crocodile as we were going through. We went to the top decks as well as deck 7 and the back decks. Around 8 am we entered the locks and were done by 1030 am. Pictures of our transit of the canal are here. Then they started calling the group numbers and we were number 2 so we went to the Explorers Lounge to wait for the tender. The tender loaded and took us to a parking lot where we boarded a bus to go to a hotel where we would catch a boat to cruise the lake to get to the Embera Indian village. When we got there they greeted us with some music and then a description of who they are and how they live. After that they danced for us and with us. Then they showed us their huts and we looked at their merchandise they sell. I bought a bowl that was made from the reeds in the lake. We boarded the boats again and cruised the lake and found 2 sloths in the trees. 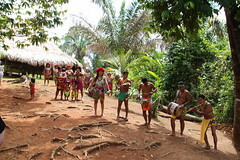 Pictures from visit with the Embera Indians are here. Then we went back to the hotel and boarded the buses to go to the visitors center at the locks. On the way we passed through the neighborhood where Steve lived when he was little. At the visitors center we were given 45 minutes to view the ships going through and look at the displays. (Also of note, this is one of the free wi-fi locations on this cruise.) 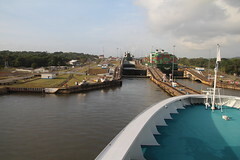 Pictures of our stop at the Gatun Locks Visitor’s Center are here. 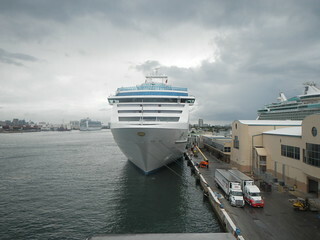 Then we boarded the buses to come back to the ship. Yesterday the workers broke the main water pipe that runs to the center so there was no water there to drink or bathrooms available. 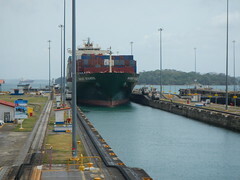 We got back to the ship at 3 pm and it had just docked from going back through the locks again. 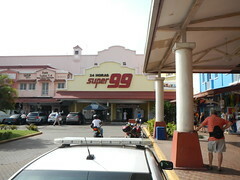 We put our stuff in the cabin and went off the ship to the Super 99 store to look for coffee. 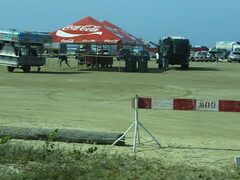 We got some local cold drinks and sipped as we walked back.The pictures we took wandering around the free trade zone in Colon are here. We went to the 430 pm trivia but only got 10 answers (only 3 groups played). Then we went to get hamburgers and fries, we also took a dip in the hot tub and had a shower. Back to the HC so Steve could eat dinner and then to deck 10 to watch sail away but it was an hour late. Later we found out the tour that took the ferry all the way through the canal had many problems with traffic accidents and a shooting scene and that was why we were late leaving. We pulled out at 8 pm then we tried to watch a movie we had brought but it wouldn’t work. So I journaled and we watched TV. We got up and had breakfast and watched the docking in Limon. Got off the ship at 730 am to meet our tour guide for Greenway. Giselle was our guide and we were on our way at 8 am. Our first stop was the Veruga Rainforest. Our driver Luis was able to get us up a narrow trail to the top of La Jungla mountain trail. We had a bathroom break and then started our 1 km trail walk. 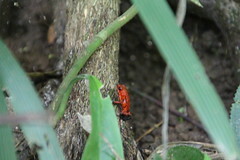 We were able to see red dart frogs, green spotted frogs, spiders, howler monkeys and 3 toed sloths. A few birds but they were too fast for pics. After we finished the hike we had another break with some fruit provided, and got back on the bus to go to the Tortuguero Canals. We then boarded a boat to travel through the canals. 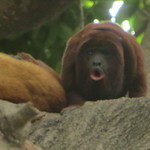 We were able to see a mom and baby 2 toed sloth, howler monkeys, and iguanas. A few blue heron and green backed kingfishers. Then we had another break with more fruit and got back on the bus to go to the Del Monte banana plantation. 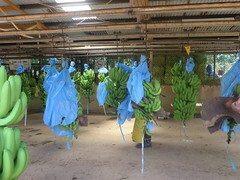 We saw how the bananas were grown and harvested and then shipped. They are picked about a month before they ever reach a store. A banana tree has only about a 9 month lifespan. Then back on the bus to go drive back into the port area and our final stop at a shopping area near the ship. I bought some Dota coffee and a painting of a sloth on a feather. Steve got his Costa Rica pin. Back on board we dumped our stuff and got lunch. Then KIP and I napped and missed the afternoon trivia. Then we set sail around 6 pm. I went to the hot tub and then showered. Later meeting up with Steve and KIP in the atrium and walked around for awhile. There’s not much to do tonight. We did not go see “On The Bayou” since we saw it on the Island. Tomorrow is a sea day with not much going on. 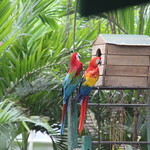 All the pictures from our day in Limon, Costa Rica are here. Not much going on. Slept in until 7 and then went up to breakfast in HC. I answered the Wake Show question about how many Jack eyes are in a deck of cards. There are 12. Then we went to morning trivia and actually won. A couple from NY helped us to finally get our key chains. Then we watched carpet bowling in the atrium, which is actually Bocci ball. It was kind of dangerous for the people walking by since they didn’t know people were throwing hard balls into the walkway. Before trivia I had gone up to workout (5K) and then lift weights then did my nails. KIP studied US History for her AP test and Steve read somewhere. After trivia I went to the Zultanite show and raffle which I did not win. Steve and I ate in Alfredo’s (Sabitini’s) and had our usual pizza. KIP was hanging with the teens. I then went to the future cruise show while Steve and KIP just walked around deck 7 until I met up with them and suggested golf. So KIP and I went up to deck 15 to play. Steve went to a port talk on Cayman Islands. Afterward KIP went back to the teens and I came back to nap, until Steve came into the room so we left to go to the HC to get some lemonade. I tried their guacamole and chips and I was hooked! Tasted so good. Then onto afternoon trivia which we did not win (for a pen). Then we left to get ready for formal portrait night again. Went down and had 6 portraits made and 13 chances to win again. Then onto dinner in the HC. KIP joined us later. We all shared desserts, chocolate volcano cake was the best. Then onto the show “Dance” in the Princess Theater. It was packed. I didn’t want to have to squeeze by people so I stood at the back. I ended up leaving early and saw Jeffery in the hallway and talked to him. The towel press had broken so no one was getting beach towels until it got fixed. He had actually taken some from another cabin to give to us. Shows it’s important to make friends with your room steward! KIP went back to the teen club and was supposed to go to the “Marriage Show”. I guess she’ll tell me later what she did. Steve went to use his Blackjack coupon in the casino. Today started at 6 am with the alarm going off. We ate breakfast in the HC. Then put our answer in the box for the Wake Show. The question was about the Grand Cayman flag and the colors. We didn’t get picked for yesterday’s even though our answer was correct. I also put a note in about KIP’s 16th birthday. Then we went to the Provenance Dining Room for a tender ticket but they just sent us down to the tenders. I think we were on the first one at 730 am. We got on land and just walked around until we found some wifi and checked our messages. Captain Marvin’s didn’t open until later when a bus driver named Melford came to pick us up. He took us to another location where we paid. They tried to get us to change to the morning snorkel and sting ray but I stuck to our plan to go the the Turtle Farm first. Melford was our guide and there were about 9 of us on the tour. He started driving and telling us about Grand Cayman. We drove by the governor’s mansion which is right on the beach, then he took us to the Hell Post Office. We stopped and took pics here and KIP got a T shirt. It was named that because of the strange looking rocks near the beach area. It looks kind of swampy now. Then back in the bus and we drove to the turtle conservatory. 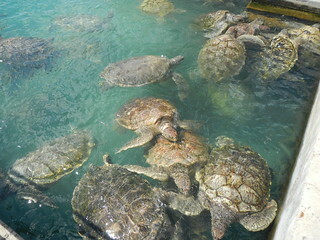 We were able to see Green Sea turtles. The female to male mix is 3:1. The hatching season just started but we didn’t get to see any baby turtles or eggs. The turtles were huge between 400-600 lbs and 35-55 years old. We also saw green iguanas, and striped iguanas. There were 2 other turtles here the Kemp’s Ridley. They had their own area to live in. We also got to hold the turtles and walk through the tank where they are kept. Then we went to the visitor center and bought a Christmas ornament and a small turtle for KIP. Then we were done and Melford drove us to the dock where we met our boat tour. We met Val and Vernon. KIP said Val looked the same age as her. He did look very young but he’s been captaining for about 4 years already. He gave her a conch shell to keep which was very pretty. Vernon gave us the rundown on what we were going to do. And the best part was we were the only ones on the boat so it was a private tour. We were able to sit on the front of the boat until we came to the stingray area. Most of the other boats were packing their people up so it was very quiet and not crowded. 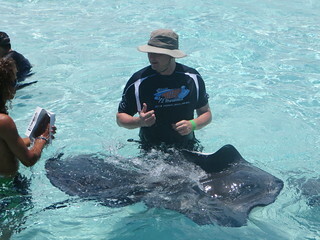 Vernon grabbed a few stingrays and we did several pics of us with them. We weren’t allowed to wear water shoes at all. We fed them squid and they sucked at it like a vacuum cleaner. The females are huge and the males look like babies. We then moved on to snorkeling on the Barrier Reef which was close by. It was actually quite pretty. Vernon thought I couldn’t swim since I said I didn’t really like to snorkel. He didn’t understand that I have problems with finding a face mask that fits properly. So we swam around the coral for about 25 minutes. There were several types of coral and some fish in there. 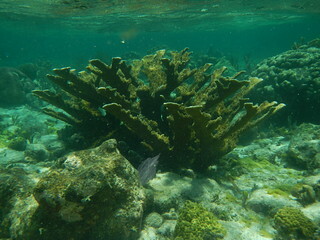 We then left and went to another location called Coral Gardens that had a lot of fish. Here we fed them and got so many pics of them. We stayed there about 20 minutes and then got back on the boat to return. 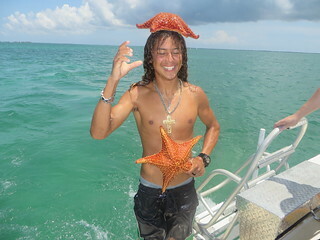 We stopped midway and Val jumped off the boat and caught some starfish and brought them on board to show us. Then we threw them back. When we reached the dock another boat had come in with a shark that they had caught. It was about 6 ft long. Then we were done and we were driven back to the the original location where we stopped to buy rum cake and Jamaican coffee. Then we walked down to the craft market and looked for Caymanite jewelery but I didn’t see anything that I liked so we went back to the ship. Got back on board around 2 pm. KIP and I took showers and she napped. 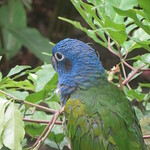 Then we met Steve for tea in the dining room. From there we moved on to afternoon trivia which we won! There was no prize at the end so we badgered James to give us something until he came up with the passport holders that I wanted the entire trip. Then we went up for dinner in the HC and KIP went to hang with the teens. Steve and I went to the photo raffle and we won the Reflections DVD (2nd place). At 8 pm we went to the 50′-60’s music trivia (we got 10/25) not too bad since we really didn’t know any of the songs played. KIP went back to the teen club and Steve and I went to get ice cream. The full set of our pictures from Grand Cayman are here. Today KIP got her 16th birthday announced on the Wake Show. We thought no one watched but she said her friends in the Teen club heard it. Today is a lazy day since it’s our last one before we get back to FLL. There was another outlet sale and I bought a wallet and nail kit. The passenger talent show was canceled because there was only 1 person in it. I guess we aren’t that talented. I went to work out again and the gym was busy today. I guess everyone needs to get the extra weight off before we dock. Steve went and spent time in the casino today. In the afternoon we saw an abandoned boat off the side of the ship and tooted the horn to see if there was anyone needing help but no one responded so we continued on our way. The highlight of the day was a talk by the cruise director and assistant of what it was like to live at sea. Then we went to afternoon trivia and then on to afternoon tea again. Pretty much rested up until the farewell show with some of the non performing crew getting a chance to show their talents. The highlight for me was a man from Brazil who danced with scarves. He had them going so fast it looked like fire. Then on to a last hot tub/ice cream session. KIP hung out with the Teens for her last night and we went to bed. We no longer own an RV since we sold it in March of this year. We came to a decision that we wanted to do some cruises and other trips but weren’t going to be able to take the time to drive to where we wanted to be in the time frame we needed to be there. Coupled with the fact that Teen Curb Crusher (now referred to as TCC) is starting college courses through AP work and next year will be dual enrolled our pickup up and go lifestyle will have to change a little. I will introduce each of us: there is CurbCrusher (now referred to as CC) who turned 50 this year. He is a partner in a software development firm and business is picking up for him which is another reason to stop RVing for now. He just can’t be away for long periods from his work and the kinds of trips we want to take would take too long. Oh and about his name-when we first got our 5th wheel he hit every curb learning to drive it and back it, hence the name. There’s me: LadyCurbCrusher (now referred to as LCC) I’m 48, and a stay at home mom who use to home school our daughter. She really doesn’t need me to oversee her work as much since most of it now is through FLVS (FL virtual school) so I have time to plan these awesome vacations we’ll be taking. Then there’s TeenCurbCrusher: she is 15 and knows everything but still needs her parents guidance. She’ll probably be going away to college in a couple of years so family trips will start going away soon. We’re trying to get as much in as we can before that happens. So on to our trip. We started planning to go to Alaska in March of this year. 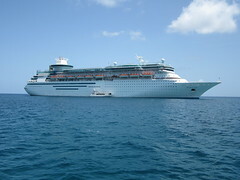 We wanted to see Denali as well as take a cruise so originally we booked a cruise tour with Princess. Then we crunched some numbers and decided we could do it ourselves cheaper so we did. We looked at all the activities that were included and really didn’t like all of them and wanted to do some things differently. Then I read a few reports on Cruise Critic and decided I didn’t want someone else managing my time for me. Then we went to dinner with our friends and they liked the idea of going to Alaska so they decided to join us for the cruise portion of the trip. Our journey starts with CC’s partner dropping us off at the airport where we will board our United flight to HOU then on to ANC. (Sorry about the city codes I use to work for airlines so I use them a lot). I worked for PEOPLExpress back in college and I remember all the “major” airlines sneering at us saying customers wouldn’t go for paying for luggage and food onboard and being herded onboard like cattle. Well, I guess they are wrong and PEOPLExpress could see the future because that’s exactly what travel is these days. We each took only 1 carryon bag and a backpack for the entire trip of 13 days because the airlines we were flying charged to check bags. And we were fine with what we brought and had no problems, in fact I know I didn’t wear everything I brought with me. I would also like to add make sure you eat before you board because United will NOT feed you anything. Not even peanuts/pretzels. The guy sitting across the aisle from me ordered a granola bar and a candy bar and the charge came to over $5. I guess I should be glad they gave me water. (our tickets cost over $900 for this portion of the trip). Our first flight was only 2+ hours and then we flew from HOU to ANC it was 6.5 hours. We landed a little after 7 pm AK time (which was 4 hours difference for us from the East coast). We made our way over to the Budget Rental Car counter and picked up a Dodge Journey. We ended up really liking this car. It was comfortable for the 3 of us with our stuff and easy to drive. Now we leave the airport to find the Embassy Suites (we stayed here both nights on points). Of course, it started to rain so our first look at AK was kind of dreary except for a magnificent rainbow (#1 of our journey) that stretched across the entire road. We checked into the hotel and put our luggage in the room and went to eat at Denny’s. Came back and took showers and went to bed. Got up really early (East coasters) and went down to breakfast that was provided. Ate well and then packed up. We decided to stop in Wasilla on our way to Denali National Park to stock up on supplies. The weather was still dreary and we couldn’t see any mountains as the clouds were too low. We got to Wasilla and stopped at the Walmart there and grabbed some snacks for our drive. While in town we stopped at the Iditarod Headquarters to check it out. We watched a movie about Lance Mackey who has won the race 4 times back to back. We checked out the displays but didn’t get to see any dogs since they were later in the day and we needed to get to Denali. Our temperature today was 44 degrees (we came from 94 in FL). I think normally this would have been a beautiful drive but today itwas very overcast and rainy most of the way. I had bought a book called the Milepost which told us of everything there is at each mile marker on the way. RVers have something similar called The Next Exit. It was nice to know when the next gas/food/bathroom would be. It also mentioned viewpoints to stop at and look at the scenery, but it always said weather permitting and our weather was NOT permitting on this drive. We did stop at the Alaskan Medal of Honor War Memorial for a quick look. Didn’t stay too long because it was very cold and rainy. At every rest stop we encountered a composting toilet but they were all clean and most didn’t smell too bad. When we were about an hour south of the Denali area we ran into road construction on the Parks Highway. We had to be guided through and had about 4 stops to wait enroute as they smoothed the road and loaded more asphalt. It took us about 45 minutes to get clear of it. Also, it stopped raining near here and we could see the mountains in the distance. Until now we couldn’t see 25 feet off the side of the road. Finally made it to the Denali Grizzly Bear Resort and campground. Checked in and dumped our stuff in the room and went to the Wilderness Access Center (WAC) to pick up our bus tickets for the shuttle ride to Eielson the next day. These were $67 for 2 of us since TCC is 15 she doesn’t have to pay. Lucky her-like she paid for anything. We got the tickets and then our tradition is at a National or State park that CC buys a pin for a souvenir, I get a park stamp in my Passport book, and TCC gets to do the Jr Ranger book if there is one. So we got all those and made our way to see the movie in the WAC about how Denali came to be a National Park. Then we looked in the gift shop where I bought a watercolor of Denali. We then walked over to the book store and visitor center to check out the displays of the animals/flora/fauna and history of Denali. We also stopped at the train station since the Alaskan RR was in with the Princess and HAL cars attached. We had tried to get a photo in Wasilla but it was moving and so were we. We walked back to the car and drove over to the park’s dog kennels. We weren’t going to be able to see a demonstration since they were at 10 am and 2 pm and no longer at 4 pm (after Labor Day) and we would be on a bus all day the next day. I had been checking out the puppies since spring on the park’s webcam so I was excited to see them in person. They were all very cute but I know that is not their purpose. During winter they deliver all the visiting scientists and supplies out in the backcounty since it is hard to get there in a vehicle. We went into the sled shed where they store the harnesses and sleds and then next door to the office where all the retired dog’s plaques are lining the walls. After that we drove back into the town area and had a great pizza at Prospector’s Pizza. Next we went down to Subway to get our lunches for the bus trip the next day. Got up early since we’re still on FL time and had coffee and pop tarts in our room and packed our backpacks with snacks, Subway sandwiches, rain gear, and cameras. This morning the temperature was 38 degrees. You might ask how I would know this? I didn’t watch the news. I packed a digital thermometer that we use at home to tell us what the temperature was each day. At hotels we set it inside next to the windshield of our car and on the cruise we set it on our balcony. So knowing how cold it was helped us to adjust how many layers we would need for the day. Arrived at the WAC and parked, went inside to wait for the call to board our bus to Eielson. Our bus driver was Craig Lewis who has been working as a bus driver for 6 years. He told us he liked to talk as he drove so we were glad he wanted to narrate our trip. The green bus drivers don’t have to talk at all, just drive the bus but most do. We were told it would get very boring for them. Before we even went a mile we saw a male and female moose right on the park road. Before we got to our first bathroom break at Teklanika we spotted a male brown bear and then close by a female with 2 cubs. We stopped for about 10 minutes so we could get pictures. Our next stop was at Polychrome Overlook(no stop on the return). We got out and climbed a hill to see far into the distance. We saw Dall Sheep before the next stop at Tolkat River which was a bathroom stop. Craig told us we would make only a short stop there to use the facilities and for us NOT to go into the store since the stop on the way out would be longer. Before we reach Eielson we also saw more brown bears and Ptmarigans right on the road. We arrived at Eielson around 1130 am. Craig had entertained us the whole way with stories of each animal we had seen. At Eielson I got my park stamp, CC got his pin, and TCC finished her Jr Ranger book and was awarded her Jr Ranger badge. I think she has almost 100 by now. We looked at the displays and listened to a ranger talk about the trails and what hikers would see. CC took one for the team and went outside to get pictures of the mountain range only it wasn’t cooperating. He told us it was too cold and windy to stay outside for long. 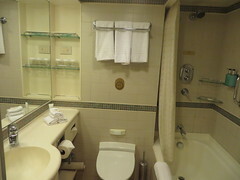 We used the bathrooms and got back on the bus ready to leave with Craig at 12 pm. You don’t have to stick with the same driver on the green buses but we liked him and he was keeping us entertained with stories so we didn’t jump ship. We ate our lunch right on the bus after we started back up. We didn’t see as many animals on the return trip, though we did see another bear and more sheep. No moose were on the return trip. The drive back had less stops but a longer one at Tolkat for shopping at the bookstore. I was able to get another Passport stamp here. We picked up a few hikers on the way back and let some off. CC seemed to always have the open seat and he struck up several conversations with each new arrival. One was a man who was in charge of Aramark (who runs the bus concession) who seemed upset Criag was talking so much. He told CC that was what the tan buses were for, since they have a naturalist/narrator on board each one. Another seatmate was a scientist who was studying some of the plant life in the park and was hiking on her days off. When we got back we thanked Craig (with a good tip!) and went inside. TCC saw they had coffee so she wanted one to warm up after the cold day we had. The buses are somewhat comfortable and there is a rack to put your stuff up but by no means were they luxurious. We decided to eat at Prospector Pizza again and gassed up the rental car and hit Sled Dog liquor for our 2 bottles of wine that we were allowed to bring onboard. When we had our RV I would scope out if there were any local wineries in the areas that we camped in and would visit them. I usually would buy a bottle or two if I liked them. My supply of local wines is getting low and I haven’t developed a taste for any widely known brands so I was happy to see that Alaska had a winery in Homer that was stocked in the store. I ended up buying a bottle of Bear Creek Winery’s Peach Apricot wine and I loved it. I just need to figure out how to get more! After dinner we walked down the boardwalk to Husky Homestead’s office and talked to girl inside since we would be going there the next morning. She gave us the lowdown on everything with the tour. Then we went back to the room and got ready for bed, to be woken up at 430 am by the train across the river. Good thing I was already awake! Everyone was awake by 7 am and we had our pop tarts and coffee again. Packed our stuff to check out since we were going on a tour and wouldn’t be back in time for official check out. We put it all in the car and walked down to the office to wait for the Husky Homestead bus to pick us up. Soon Ellen, Jeff’ King’s partner, picked us up and we were on our way. Cost for this tour was $177 for the 3 of us, and I felt it was well worth it. As we arrived we were each handed a puppy to hold and cuddle. This was definitely TCC’s favorite of the trip. The puppies were adorable! We had our pictures taken with them and watched more puppies play in their training pen. After everyone arrived from their various locations we were invited to sit on benches in front of the older dogs houses and Ellen told us about some of the dogs training. Then she left to hook up dogs to the ATV for their morning workout. All of the them were barking and straining at their leashes wanting to go. She said throughout the day each would get to go on a long run with the ATV. It was kind of sad to see their faces when they weren’t picked to go. Then Trent continued the demonstration while Ellen ran a short lap which we could see and then a longer track through the woods that we couldn’t. He then showed us how they use the huge hamster wheels to let the dogs run and exercise. He also told us they are only chained to their houses when tours are given, otherwise they are free to roam around. After September they go into full training mode. The Iditarod is run the 1st weekend in March lasting from 9-14 days. Then we moved inside where Jeff King spoke to the group. He was very funny and personable. He told us how he made sure the dogs were taken care of during the race and that they had to provide everything themselves during the whole race with no outside help. He averages only about 90 minutes of sleep a day during the race, since during a 6 hour stop he would be still working at caring for his dogs for 4.5 hours more making sure they were fed and watered (melting it from snow) before he could rest or eat.. He is a 4 time champion, and 57 years old. He told us the oldest person in the race was 87 years old and that he expected to still be racing when he’s that age as well. Also he talked about his 3 kids, all girls, who didn’t understand when their cousins in northern CA would tell them they got a snow day off from school when they only get them in AK when it’s 50 below zero. After Ellen returned us to the Denali Grizzly Bear we set out for Talkeetna. The weather wasn’t nearly as bad as when we were coming up on Thursday. We were able to stop at quite a few overlooks and see the mountain ranges. We took lots of pictures and I spotted a brown bear way up high on the mountain and we stopped to take his picture. I thought it might have been a black bear since it’s coat was so dark but a park ranger looked at my pictures and saw the shoulder hump of a brown bear. Oh well. It was probably only a year or two old though. I was really happy that I spotted it. We finally got to Talkeetna around 230 pm and drove into downtown (all 3 blocks) and bought tickets to the Talkeetna Historical Museum and toured their 1 room school house, trapper cabin, RR depot, and Mount McKinley mountaineering exhibit. This had a local ranger named Jay Katzen giving a talk about climbing equipment and what it is like to climb Mt. McKinley. He had pictures of people climbing and stations they stop at to pass around to us. When he was at the 2nd to last station TCC passed out on the floor. She was out for about 30 seconds and then opened her eyes, jumped up and shouted “Basin Camp!”. We all laughed and she was OK after that and he finished his speech. When he came to talk to us we showed him the pictures of the bear I spotted and he identified it as a brown bear and told me what some of the plants were that we had seen on the way to Eielson since our bus driver, Craig, was not as familiar with plants. He told us that the short red plants are burberry and the trees are spruce and willows. The mushrooms we took pictures of at the Denali overlook wayside are poisonous, but really pretty. We talked with Jay for awhile and he offered to send me a National Park stamp from Talkeetna (it was waiting for us when we arrived home!-Thanks Jay) and then left and got in the car to go to the Flying Squirrel Cafe. It was highly rated, but to us it seemed like a hip, vegan kind of place. We don’t usually hang out in those. We did enjoy our meals, TCC and I had a Mediterranean pizza with spanikopita, and CC had a bowl of wild rice chicken soupand a grilled cheese panini. All of it was very good. Then we drove a little further until we got to a seaplane base and stopped to take pictures and continued on to the Denali Overlook Bed and Breakfast run by Ron and Mable. CC was fascinated with their dumbwaiter that moves the luggage upstairs. We are staying in their Summer Solstice room with a queen bed and a twin bed, with the bathroom next door. We put our stuff down and then walked around outside. The rain had finally stopped and the mountain range was very clear in the distance but not enough to see Mt. Denali yet. TCC has started a puzzle downstairs and played Boggle with her dad while I catch up on my journal. I think I can see a faint outline of Denali in the distance looking through the big picture window. But I was wrong and it wasn’t when I compared it to the labeled picture in the living room. I was told later that Denali was still behind the other mountains and hidden from us. The setting sun on the range was very picturesque but the clouds were starting to come down instead of going away and we never had a complete view of Denali. We all filled out our breakfast orders for the next morning. It looks like blueberry pancakes are on the menu. Yum! After doing that and me finishing up my journal we all played Alaskan Monopoly. CC ended up winning even though I owned all the expensive properties. We settled into bed after showers and unfortunately this bed was so soft and smelled of laundry detergent so strong it was not restful for me. Once again at 430 am a train went by, but this time we couldn’t see it because the tree line was so thick. We all got up and had a great breakfast at the B&B. Blueberry pancakes were great but the weather was not. After breakfast Ron and Mable showed us a video some of their guests had taken during a stay a few weeks ago. It showed 3 small brown bears popping up near the edge of their property and playing on their yard swing and walking all over the front lawn. Then all of a sudden a huge mama bear pops up as well and rounds them up and shoos them off. The B&B had had a wedding outside the night before and someone had left a paper plate on the swing with food scraps on it so they were attracted to it. Kind of scary since we were sitting on that swing just the night before enjoying the views. I think I would have died if 4 bears would have popped up in front of me! Before we left Talkeetna we went back into the town to do the historic tour since I had picked up a brochure with every location listed. Since it was raining we ended up just driving it because there was no one out this early on a Sunday morning. We saw the Ole Dahl cabin we missed the day before on the museum’s property. Tried to find the other sites and photograph them but not all are well marked. We also wanted to stop at the birch syrup factory that Ron and Mable told us about but they opened after 11 am and we needed to get back to ANC. It rained the entire way back on us. We didn’t stop as much because the weather was bad the clouds were overcast and we couldn’t see anything again.Stopped in Wasilla at the Walmart for a bathroom break and to pick up more chocolate covered macadamia nuts. We made it back to the Embassy Suites. They had a room ready for us so we checked in and then called our friends S & B. She and I have been friends for over 20 years and S was in our wedding as a bridesmaid and B filmed it for us. They had arrived the night before and checked into the hotel. We asked if they wanted to go sightsee in ANC with us but they just wanted to rest. So we gathered our cameras and maps and set out for Earthquake Park, Sleeping Lady Park, and Resurrection Park. We saw the official start location of the Iditarod race marked by a dog statue, there were some cool murals painted on the sides of the buildings commemorating the race. We also went to to Log Cabin visitors center with the grass roof and walked through the Sunday market next to the Alaska Railroad building where we leave from tomorrow. We ended up eating at Mexican restaurant similar to a Tijuana Flats and then went back to the hotel. CC and TCC went to return the car at the airport and ride the shuttle back. CC wanted to go for a run of 5 miles and TCC and I went down for the Happy Hour drinks and appetizers. We were down for about an hour people watching and watching football on TV before we called it a night. CC had come back from his run, showered and went downstairs. We repacked for the train and went to bed. Got up early and had breakfast at the Embassy Suites, finished packing and went downstairs for the shuttle to take us to the train station. Saw S&B at breakfast. They look real tired, probably like we did when we arrived last week. The shuttle came and we had a full van to the station. We arrived about 830am and checked in. The agent said we could take all of our luggage onboard the train since it was carryon bags. We were put in the B car which was a regular train car the A car was a glass domed car (those people could not do carryons since there was no overhead space). Our car had lots of room and the seats were comfy. The domed car was completely full for the trip. We could move onto the platform to take pictures from outside whenever we wanted. They had made announcements that the weather was so bad in Whittier that any harbor cruises people had booked were cancelled. We had thought about doing one but now I was glad we hadn’t. The weather was clear in ANC but I guess further South it was very foggy and raining. We finally boarded the train and pulled out on time at 945 am. We had very large windows so it was easy to see the scenery outside. CC spent most of the time outside on the viewing platform. I went back often but it was very cold out there to stay too long. They gave us a Railroad Milepost when we checked in so we could track our journey. We went by areas called Potters Marsh, and Beluga Point, where we had one quick sighting of 2 beluga whale tails but no time for a picture because of the trees. It seemed every time I wanted to take a picture the trees would pop up out of nowhere. We did a quick stop in Girdwood to pick up about a dozen people and then went through the Chugach National Forest and Turnagain Arm in Cook Inlet. On through Old Portage station and we saw Spence Glacier. We saw several beautiful rainbows and lots of waterfalls. Then we passed by the earthquake area where there were lots of dead trees because when the earthquake happened the land caved in and salt water from the inlet covered the area killing and preserving the trees ever since. We went through 2 tunnels and saw several more glaciers before getting to Whittier. Check in was pretty smooth,but where the train trip was dry and it only started raining about 30 minutes before our arrival in Whittier, the area we had to check in was soaked, windy and cold. We could hardly see the harbor or the mountains. 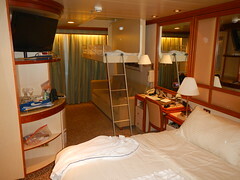 Our cabin (C226) was ready on arrival and we unpacked and got settled in. Then we went up to the Bordeaux dining room for lunch. All the crew members try to get everyone to eat in the Horizon Court at the buffet, but I had read on Cruise Critic that one of the dining rooms was open so we checked it out and it was. We had stopped and bought our coffee cards when we got on the ship so TCC and I made use of those after lunch and started on the scavenger hunt around the ship to collect stamps. We didn’t win anything there. Around 4 pm TCC was able to go check out the Teen Club and a parent had to go with her to register her in so I was nominated. We met Zhanna, who was in charge, there were only 2 teens on the cruise this week. Then we went back to dress for dinner. Went to the Provence dining room and it was open seating so we didn’t meet our tablemates tonight. We ended up sitting by ourselves because we thought S&B would be joining us but they didn’t. At 745 pm we had our muster drill and went to the Princess Theater with our life vests. After that TCC went to the Teen Club to watch a movie and stayed until CC went to find her around 11 pm. We got our Princess Patter which we would call the Pitter Patter and planned out our next day activities. We didn’t get up until 630 am and then showered and got all our dirty clothes together and went to the laundry. We got them started in the washing machine and then went up to eat breakfast in the Horizon Court. It soon became our go to spot for food for our entire cruise. We had picked a table right at the front of the ship with big picture windows and were soon joined by a man who was doing a back to back cruise for his and his wife’s 50th wedding anniversary. He told us it was his favorite spot to sit at. We had a good conversation with him. His wife was sick since it was so choppy but none of us were bothered by it. I know my friend S gets really motion sick so I hoped she was doing OK. B stopped by our table to tell us S was sick and staying in the room today. We left breakfast and moved our clothes to the dryer. Then went to pick up a Brain Waves quiz from the library. This would soon become TCC’s favorite place on ship. Not sure if it was reading, or the big windows or the cute Australian crewman who worked there. After stopping in the library we went to the internet cafe and sent a few ship postcards. TCC and CC went to the Explore Ashore port talk with B. Later we checked out the $10 sale with B but didn’t see anything we couldn’t live without. We also have to be careful how much and what we buy since we are only doing carryons. So no extra stuff for us. Grabbed a coffee and went back to the laundry to get our clothes. This was a busy room this morning, you wouldn’t think that on the 1st full day on the ship. Went back to the library to look at the scavenger hunt list but it was too involved with buying things so we opted not to do it. TCC picked up the egg drop rules sheet and is thinking she might do it. She would have to build a contraption to put an egg in and hope it doesn’t break when thrown over the atrium area on the last day of the cruise. I encouraged her to do it. We all went to the 1115 am shopping talk because TCC wanted the free bracelet you get when you visit Diamonds International stores in the 3 ports. Then TCC went back to nap and CC and I went to Sabitini’s for pizza. He had an Island and I had a Caparesses?. It was very good pizza. After eating we went to the scavenger hunt drawing but we were losers. Came back to the room to watch Alaska documentaries and catch up on the journal. CC went to read his Tablet in the library. I’m going later to hear Doug Capra, who is the Naturalist on board, talk about the glaciers, and then I’m going to the gemstone talk with TCC. While in the Wheelhouse Bar I was seeing land in the windows so we had entered Yakutat Bay and Hubbard Glacier was ahead. I left TCC in the room and went forward to the “secret” deck on Caribe where I saw ice floating around the ship. Then I went as far up as I could and I found B and CC on the 15th deck taking pictures. I had the binoculars so I was looking through those while CC was taking pictures. We had decided not to go to formal night since Hubbard cruising was from 5-6 pm and dinner was at 515 pm. The glacier was not to be missed, that’s why we did this so we could see things we normally don’t see everyday. I wasn’t able to see any calving myself but CC said he saw a few small ones and B saw a larger one. We stayed outside while the Island turned all the way around to let everyone have a great view and then we went out on our balcony for the sail out. Later we went to the HC for dinner and then to the hot tub. We looked in the Patter and chose to do the Miracle Lyrical, which was something like Don’t Forget the Lyrics instead of seeing Motor City. We also took a “formal” night picture and got a coffee and hot chocolate. Tomorrow is Glacier Bay. The day starts with no sleep on my part. We are going to see glaciers, lots and lots of them today! We start with the National Park Service rangers boarding the ship near Bartlett Cove about 9 am. TCC has a JR Ranger session in the kids area at 10am where she earns her Glacier Bay badge and book. While she does that I get coffee with my card and CC buys his Glacier Bay pin. I also received my stamp for my Passport book. Our first glacier is Grand Pacific and then the Marjerie glacier. A HAL ship is in front of us. Only 2 ships per day are allowed in Glacier Bay. We go around Russell Island and see Muir Glacier, John Hopkins Glacier, and then Lamplugh and Reid Glaciers. I finally saw some calving happening. I also saw a quick peek at a seal and some birds but that was it for me for animal sightings. Others told me they saw a couple humpbacks and seals but there wasn’t a lot of animals out today. Lots of waterfalls and silty glacier rock as well as ice floating in the bay. The birds were mostly kittywakes. CC was starting to have trouble with the lens on our new Canon T5i camera. It would take a picture and then stop and say something about not being able to communicate with the camera. It’s a good thing I did bring another lens. It’s not as great because the zoom isn’t as powerful. I’m bummed that it is not working properly. We all had lunch at Sabitini’s with S & B today at a table near a window so we could still see everything. This became the only meal we ever ate with them on the ship. At about 4 pm both TCC and I took naps, and then I caught up on my journal. There wasn’t a lot going on entertainment wise on the ship today except Doug Capra giving commentary about the glaciers. Princess figures this is what you are here to see so they don’t do any games or entertainment while in Glacier Bay. This is the only night we ate with our tablemates in the main dining room. They are from Indiana, a couple, and her sister. S & B did not show up for dinner tonight, but they had eaten with them for formal night last night. We talked about our excursions we had planned and what was coming up. The food is better in the HC and TCC said it didn’t take as long to fill your plate and eat there either. We all headed back to change for the hot tub and CC and TCC got ice cream. Talked to a couple of guys in the hot tub for awhile, then went back and took our showers and called it a night. None of the venues have been crowded. 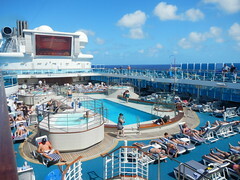 All the shows have seats available and the hot tubs are almost empty on this ship. The dining room was only about 40% full when we ate there tonight, and the buffet always seems to have seats or you just invite yourself to someone’s table. 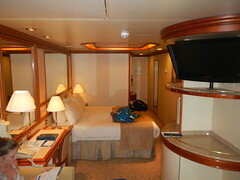 It is very different from a Caribbean cruise. Got up early and saw the Grand Princess coming into the harbor. She looked just like a ghost ship coming through the fog. We then went to eat in the HC and get ready for our day in Skagway hiking and floating on the Chilkoot Trail. First we exited the ship and had our pictures made with a polar bear and orca. Really it’s just 2 crew members wearing costumes. 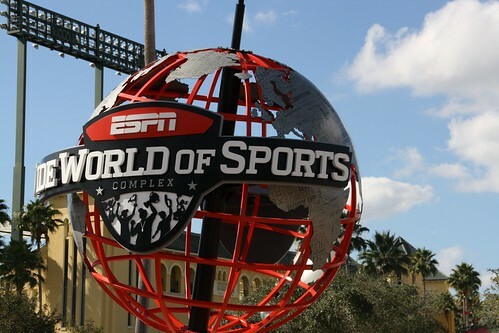 TCC was upset because we come from Theme Park land in Orlando she was commenting that they shouldn’t have the heads off the costume so people could see the person inside. That’s a theme park no no. And they were talking to each other, also another no, no. So we were laughing and joking how they wouldn’t last long at a theme park when it was our turn to have our pictures taken. CC later went back and got that one with our free coupon for being returning Princess cruisers. We walked off the ship and into what looked like a wild west town. The train was loading and getting ready to take people up to the White Pass Trail and Canada. We walked into Diamonds International so TCC could get her charms and then went to the Skagway visitors center for a town walking map. We watched a film in the Klondike Gold Rush National Park visitors center about hiking the Chilkoot Trail and all the hardships endured. TCC started working on her JR Ranger badge. This one is pretty cool since it is made out of wood. I stamped my Passport and CC bought his pin. We then did a short walk and took pictures of the buildings, including the AB Hall, The Golden North Hotel, and the Red Onion Saloon. While TCC was filling out her JR Ranger book CC went outside and took pictures of a giant snow blower that they use on the railroad tracks to clear the snow. Then it was time to meet our tour guide Bob at the Chilkoot Trail Hikes office. There was 1 other young couple on the trip so just 5 of us for the hike. I kind of breathed a sigh of relief because I’d read where people who were older or out of shape slowed down the hike for everyone else. So I hoped they were fit so it would go well. Bob drove us out of town and on the way he stopped at a small stream and showed us pink salmon, the color of Pepto-Bismol, swimming up it and the eggs that they laid. There were a lot of dead fish in the water because they die after planting their eggs on the rocks. The eggs hang around from a few days to a couple of weeks and then freeze in the water and thaw in the spring and become adult salmon who do it all over again. With so many dead fish it was kind of smelly there. We also stopped to see a bald eagle near the road and Nahku Bay. We saw many young bald eagles on the way up to the hiking area. We stopped near the top and Bob gave us walking sticks and a last bathroom break until we were done. Then we were on our way. We had been warned that it had rained the night before and the trail was probably inaccessible in areas and we might not do the whole 2 miles that we were supposed to. It was pretty cold, in the 50’s, we could see our breath most of the trip since it got colder the higher we climbed. But at least it wasn’t raining. The clouds were halfway down the mountain and seemed to be clearing away with the sun coming out. The trail seemed rough-wet, with lots of roots, rocks, and ferns everywhere. There were lots of ups and downs climbing the rocks and then descending again. Some of the steps when there were any were very steep. Bob, and the movie we had seen at the visitors center, told us how the Canadian Mounties made each person going over the pass carry 2000 lbs of supplies to last them an entire year. Most had to take 20-25 trips up and down the pass to accomplish that goal. It was hard enough with a camera and a small daypack with no rain or snow, it must have been awful with all that equipment. In TCC’s JR Ranger book it had a list of everything they had to have. It covered an entire page. They also made the trip (all 20-25 of them) in 4 weeks!. The plants we saw were beautiful, the Alaskan coastline is mostly rainforest, and here on this hike we could really tell. Lots of mushrooms, ferns and moss on the rocks. We climbed up and down for almost 2 miles. There were plenty of bear tracks that were fresh from just last night or this morning. I was thankful we never ran into one on the hike. There were lots of what Bob called cranberry bushes with fruit on them on the trail and the bears had been eating from them and digging up roots. We walked until we came to an area that we had to have rubber boots to cross. Bob had a helper that brought boots to us and we changed into them so we could finish the walk and get to the inflatable raft. So we hiked through a huge wet area and a few large puddles before coming up on the raft. Bob dared us to put our hands in the water for 10 seconds. We all did but only me and the guy from the couple could keep them in that long. The water was freezing and I only kept mine in that long because I’m competitive. Bob showed us how to get in the raft without falling on our butts in the water and after feeling that water there was no way I wanted to sit in it! So we all paid close attention. We put on the life jackets and tightened them down and all got in the boat to start our float. Only Bob rowed so we were all able to take pictures and enjoy the trip. Saw bunches of eagles. The water was flowing about 5 mph which seemed quick to me. He showed us how the river had changed course through the years. As we got closer to the end we could see the face of the mountain and a few new glaciers. We floated up to an area where we would get out and had salmon, cheese, crackers and cookies for a snack. We helped put the raft back on the trailer and Bob drove our family to the Gold Rush Cemetery so we could walk around there. By this time it was actually feeling warm and we started shedding clothes and jackets. The sky was very clear and the clouds had moved off. We started off looking at a big gold nugget next to Lucy and Martin Itjen’s graves. And then we took the path up to all the other graves, most of the headstones were made out of wood. The resting places were for Jefferson “Soapy” Smith, Frank Reid and others. After looking around the cemetery we continued our walk up to Lower Reid Falls. CC loves a good waterfall so I knew he would like this. It reminded us of Ruby Falls in Chattanooga. It was really beautiful and peaceful but very loud. TCC took most of the pictures at the top. There was a cave in the rock wall, maybe it was a bear den. You couldn’t see where the water was coming from it was so steep. It was just as cold as the water form the float trip. We took a self portrait with our DSLR camera here. And it was then we had problems with the camera again. After we had climbed down and walked back on the road to go into town we saw a couple of buildings we wanted to take pictures of but the camera was acting up. It was only 3 weeks old and I was getting upset that we had so many problems with it. Later CC found out that he never took it off self portrait so that why it was delayed when taking a picture. It is a good thing we carry 3 cameras with us. We walked back into town after the falls and checked out a few stores and a reproduction bar that was part of the Klondike Gold Rush National Park that TCC wanted to see. We bought fudge to eat and went to DeeJon’s where Bob told us we could try some birch syrup. But we can’t carry large amounts of liquids with carryons so we didn’t get any. I found a watercolor postcard of Skagway for a souvenir. By this time it was getting later in the afternoon so we walked back to the ship. We ate in the HC again and only TCC wanted to go to a show so she went by herself. Tonight was Duncan Tuck, a comedian-musician, and the International crew show. CC and I decided to go to the hot tub. Every night CC transferred pictures from our cameras to USB sticks. That was a big job and it took a long time because we have 3 cameras which we are all taking pictures with as well as videos. We took no less than 300 pictures a day. Today was our Harv and Marv day for watching whales. S & B came with us on a 28 ft boat. S looked a little pale but she was a trooper. Capt Russell was our pilot. The boat was very clean and had a small (and I mean small) marine toilet and 2 benches lining the inside. You could go forward when the boat was stopped or in the back area anytime to take pictures. We had binoculars, blankets and snacks with drinks. We headed out to find some whales and came upon a few humpbacks. Capt Russell got a call from another boat that they were seeing orcas in a different area so we went there. 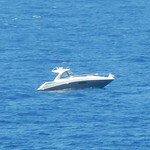 A large catamaran followed us and an orca kept surfacing next to their boat. This trip was better than Hawaii because Capt Russell positioned himself in front of the whales and let them come to us so we got a better view. Boats are not allowed to get closer than 300 ft. But if the whale swims to you while you’re in neutral it’s good. I was able to get several tail pictures but no breaching. Wrong time of year now I guess. We then went back to our original position and continued to view the humpbacks. There was a mom and baby hanging out near us so we got lots of video and pictures of them. I think Capt Russell said they give birth in Hawaii and then come to Alaskan waters so they can eat since they don’t the whole time their in Hawaii. The males only hang around long enough to impregnate the females and then they head out. After Capt Russell brought us back to the dock we got a group photo, the only one with all of us. And then we boarded a shuttle to Mendenhall Glacier where we got off to explore. S & B wanted to go shopping so we said goodbye. We walked up to the Mendenhall Glacier National Park visitor center and did our usual routine, JR Ranger handbook, Passport stamp and a pin. We watched a movie about how the glacier was formed and how it is moving. TCC finished up her book after hearing a ranger talk about salmon and then we walked up the trail to see Nugget Falls and the glacier. There were large icebergs floating in the lake area -the first big ones I had seen so far. We were lucky because everyone was coming back up the trail and when we got to the end there was no one there. So most of our pictures only have nature and us in them. We took our self portraits, and remembered to reset the camera. After hanging around for awhile we headed back to the Island Princess on a tan bus. The driver didn’t charge us for TCC. ($16). We walked around town and found the Capitol building but it was being worked on and was torn up. We bought some fudge but couldn’t find a watercolor anywhere, so none for Juneau. We found the Patsy Ann statue and the lighthouses of Alaska signs (I love lighthouses). Took pictures of the Mt Roberts tram and walked back to the Island Princess. It was a short day for a port day-everyone had to be back on board by 330 pm. Tonight was a formal night and the only one we got dressed up for. We still didn’t eat in the main dining room though. The goal was to get our pictures at all the photographer booths (there were 7 I think) so we could choose a new family photo. CC had on-board credits to spend and this was what we were buying with some of it. So that’s what we did, we figured at least 1 would look good.. At each booth they gave us a ticket to win some photos. TCC filled them all out and we dropped them in the box. Guess what! The next night they had the big drawing and I finally won the big prize! 4 photos of our choosing for free! Yeah. So we were able to chose more than we thought we could. Christmas gifts for the grandparents! Later we ate in the HC again because the menus for the main dining rooms aren’t to our liking. CC and I changed into swimsuits and headed you know where. TCC went to the Marriage game show and the “Do you wanna dance” show. Today is Ketchikan. As we were arriving we saw several float planes taking off ahead of us. Probably going to Misty Fjords. We sailed past the Ketchikan airport which was interesting to CC and I, since we had both worked at an airport before. We then sailed past the Ketchikan salmon capitol sign. After we docked we took pictures of the “No Puffin” sign, The sculpture “The Rock” and the rain gauge, which this year was near 76 inches but last year was around 150 inches. Today was a no rain day for us which was highly unusual we kept hearing. In fact, it was so nice we were all just wearing our raincoats (just in case) and a regular shirt. No long underwear or layers today! We don’t really have a lot of plans here. Diamonds International is closed for Yom Kipper so TCC does not get her last charm. We catch the city bus ($2 for all day pass) and go to Totem Bight State Park and Potlatch Park which is next door to the state park. We ended up with a crabby bus driver whom I named Crabby Cathy. CC sat next to a guy who works at a local marine yard and chatted with him until he got off the bus at his workplace. CC always seems to find a bus/boat/plane/train…buddy. The next stop was for Totem Bight. They had a group tour going on but we avoided that and grabbed a self tour pamphlet and did our own thing. There were about 14 totems and a longhouse to go into. The most important part of the totem is the bottom we overheard the guide say. We were able to stay ahead of the tour group and get a lot of good pictures. It was hard getting the entire totem in a picture because they are so tall. When we finished with Totem Bight we walked over to Potlatch Park which is privately owned and run by a 3 generation family. The grandson was carving a totem by hand when we showed up. We asked him about his electric tools and he told us they use those to mass produce a small craft for the Disney Cruise kids when they come to visit. But everything he does on the large totems is completely by hand. They are rather large even when laying down. There was a nicer Potlatch (longhouse) and several more totems as well as some carved wolves in the woods. We bought our Christmas ornament here. We got an eagle totem that is hand made by an Alaskan. I wanted a whale but they had sold out as it was the end of their season. But we had seen many eagles so that was a good choice as well. We then caught the bus back to town and wandered around. We walked up Creek Street and saw the salmon run and ladder. I believe it is sock-eye salmon here. The smell was horrible. There were lots of dead rotting fish. I don’t think it would be pleasant to live near here. Then we walked the boardwalk up to Married Man’s Trail. Saw a few houses of ill repute. We walked through Whale Park with the Knox Brothers clock and replica of Chief Kyam’s totem pole. We went to Subway for a bathroom break, cookies, and a soda. We shopped at the Tongass Trading Company. I bought an inexpensive earring/necklace set, TCC got an Alaskan sweatshirt, and I talked CC out of a denim shirt. After looking around for watercolors someone told us to go to Scanlon Gallery, so we did. The art there is beautiful. I wish I had more room to get souvenirs but a watercolor will have to do. We found 3 and voted for the best one. It ended up being a mom and baby humpback. Then we headed back to the ship. I told CC about the SE Alaska Discovery Center that I had read about and I was going back to check it out. He joined me but TCC wanted to read in the library again. We headed out and found it and had a great chat with the employees there. Once again, CC got his pin but he was able to add a Totem Bight pin as well, since they sell their things at the center. I added a stamp to my Passport as well. CC had stamped a piece of paper at Totem Bight so I had that too. They closed the center at 3 pm so we had just made it. Once back on ship I told CC I wanted to go to afternoon tea, but he didn’t so I went alone. I sat at a large table with people that were all retired from Disney World. It’s a Small World After All. We had seen their door signs and one of the ladies was always wearing mouse ears during the cruise. They all take a vacation together each year. Several lived quite close to us. We ending up eating dinner in the HC again and went down to the picture area to see our photos and for the drawing at 7 pm. S & B were looking at their photos as well. We gathered them all together to judge which was best and CC went to hear the drawing. As the final prize they called my name so we got 4 of our photos for free. Yeah! I had heard that tonight’s show “On the Bayou” was supposed to be very good so we made plans to see it. We went to the 8 pm show. All I can say is the scenery/sets were awesome. The actual story and the singing was off. No hot tub tonight for us. We’re going to sleep in as late as possible tomorrow. Pretty much a lazy day today. We all woke up late. The weather was hazy and overcast. Had a very late breakfast and spent time catching up on my journal. CC and TCC left to put together their egg drop entry. The decks were closed because there was a medical emergency on board and a helicopter was supposed to come. After an hour’s wait they opened the decks back up but announced that a medical boat from the Canadian Coast Guard would be arriving to take the passenger off ship. So I went to Sabitini’s by myself for lunch after being stuck in the Wheelhouse Bar for an hour listening to a crew member talk about detoxifying yourself. There is a reason they don’t give this seminar at the beginning of the cruise: no one would eat, drink alcohol or coffee or soft drinks and have fun. So no profit for Princess. On the way back to the room it was time for the egg drop contest so I parked myself on the 7th floor in the atrium to watch. Only TCC and CC had entered the contest. Their egg contraption hit the stair handrail so it cracked the egg inside. But since they were the only entry they each got a prize of a gigantic Princess water bottle. They first tried to give CC a bottle of champagne but he turned it down since he doesn’t drink and we can’t take it home with us. Since they hadn’t eaten they wanted to go to Sabitini’s for lunch so I went with them even though I ‘d just been. The host gave me a double take because I’d just left. We finished in time to go back to our balcony and see the Canadian Coast guard come and get their patient. CC had gone down a few decks and was near a crew member that filled him in. The woman was elderly and traveling with a granddaughter that was handicapped. We had seen them several times but the first time was in Crooner’s Bar where the granddaughter was making a scene because they wouldn’t serve the grandmother coffee, since they have a separate coffee bar on the ship. It took about 45 minutes to transfer her while we were dead in the water. What a way to end a cruise. I went up to the solarium to finish up my journal and then we’re going to afternoon trivia. We didn’t do too bad got over half right. CC and I played the miniature gold course during the afternoon as well. Hit the hot tub and then went to pack after dinner. It’s been a fun cruise but very different from others I have taken before. People have commented that the age is really old on the Alaskan trips. There were a lot more older people but we saw several 20’s, 30’s 40’s and 50’s as well. There were about 10 kids total on board so not a lot of children. But all the ones I saw were well behaved. We were always able to get an elevator (a first!) when we wanted one. Seating was available at shows. Most of the front rows were empty unlike Caribbean cruises. I guess people weren’t able to walk up and down many stairs so the back was always full. The Horizon Court buffet area was sometimes full but we always found a table or were able to sit with others. There was no rude behavior at the buffet and it was very clean. No food on the floor or dribbles from one food on the buffet into another. The waiters would bring your drinks to you. The halls were quiet, I guess most people went to bed early or were very respectful. People held the elevators for others. Just a different vibe, and I liked it. I wished we would/could have had dinner together with our friends every night but it didn’t seem to work out with our schedules and what we wanted to do. Glad they were able to join us on the whale watch or we might not have ever seen them. I would like to go back one day but I can wait a few years since there are other things on my must see list to see first. So, it has been a while. And a good bit has happened. There was camping from April 2012 – February of 2013, but in March of 2013, we sold the motorhome and decided to have some different vacations. More on our first adventure without the motorhome in a future post, but first, lets see if we can catch up for a year and a half worth of stuff. April rolled around and its birthday time in the CurbCrusher household for Little Curb Crusher. Since our new gifts are experiences, we headed out to Fort Wilderess in the motorhome. Not a lot new to say about Ft. Wilderness since the last time visited, but this time we did do something different. 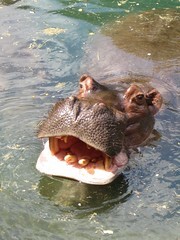 We went on the Wild Africa Trek tour in Animal Kingdom. 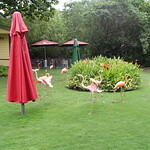 This is basically a hike through some of the area that surrounds the Killamanjaro Safari ride, giving you an up close view of the animals from a different angle. You also get a ride in across parts of the savannah in an open truck, and a lunch at the pavillion that is in the middle of the savannah. On Saturday we wondered over to Celebration for the Great American Pie Festival, which is a fantastic all the pie you can eat event. All in all a great trip. Needless to say, we visited the Magic Kingdom, ate at the Earl of Sandwich and other stuff on this trip also. Clink on the link for pictures from the Wild Africa Trek, the Pie Festival and the rest of the trip. Still May, but we headed back to Hillsboro River State Park. We’ve been here a number of times, and went back with the Florida Pop-up Camper group for a Memorial Day celebration. 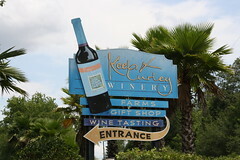 During this trip we visited the metropolis of Plant City, visiting the Keel and Curley Winery, the Parkesdale Strawberry stand, and dining at the excellent Fred’s Southern Kitchen. 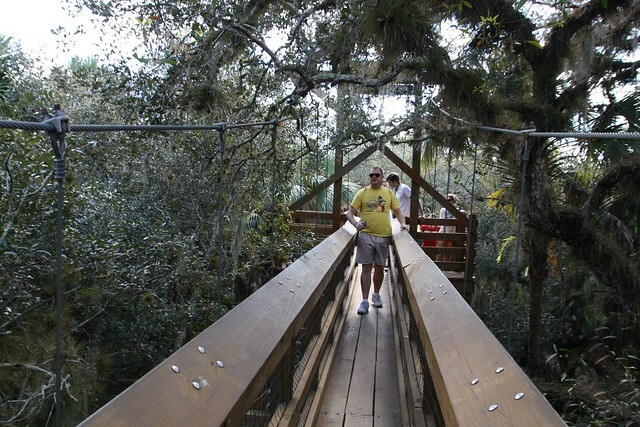 Photos from around Plant City are here and those from the state park. 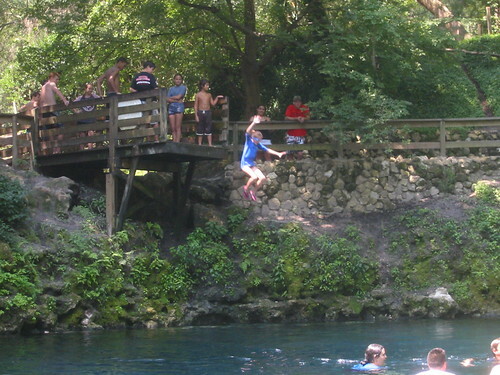 It’s June, and hot in Florida, so a trip to some springs is in order. 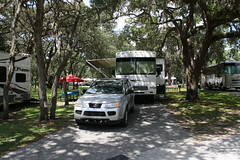 We took the motorhome and headed to O’Leno State Park. Which doesn’t have any springs. 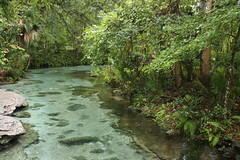 But…., Ichetucknee State Park, which has springs and a river that flows from them, is located very close by. 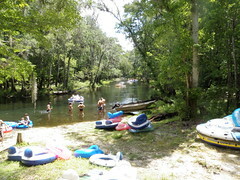 So we took Saturday and tubed the Ichetucknee from the headsprings down to the last pull out area in the state park. Photos of the tubing trip and those from the O’Leno. Well, July is anniversary time, so we sent Little CurbCrusher off on a church youth trip, and the adult CurbCrushers headed out on a four day Bahamas Cruise on Royal Carribean. It was a nice break, and pretty much to a place we’d been before. We took ourselves on a walking tour of Nasau, but mostly relaxed and wondered how Little CurbCrusher would react when she found out we had taken a cruise without her. Photos from the cruise are here. July is also 4-H Marine Science Camp month. For the second year in a row, Little CurbCrusher attended the camp in Niceville, Florida. So we took advantage of that trip to spend a week on the beach in the RV at Grayton Beach State Park in the Florida Panhandle. During this week we visited a number of other state parks in the area, driving as far as St. George Island, stopping in Apalachicola and Port St. Joe to see the John Gorrie Museum and the State Constitution Museum. It was on this trip that we decided that we were going to start working on selling the RV. So the final day we cleaned it up real good, and then took the pictures that we used when advertising it for sale. 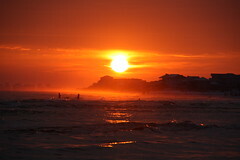 Follow the links for photos from Grayton Beach, St. George Island, Apalachicola, and Port St. Joe. August, and once again (really look back over the past two or three Augusts in the archives) we’re headed to Rock Springs county park for the springs. We enjoyed the weekend, a bit of tubing, a bit of hiking and generally being lazy. Follow the links for photos from Rock Springs. Look back through the archives and guess. 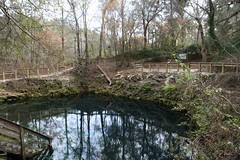 Salt Springs. 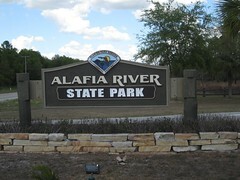 Located in the Ocala National Forest, this is a great little spring and campground. We were there for the second straight Labor Day, and made our regular visit to Sparky’s in Astor for the cheeseburger. 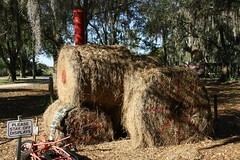 Follow the links for photos from Salt Springs. We now enter the doldrums, not a lot of pictures and few trips. We headed back to Highlands Hammock State Park near Seabring in October. We re-visited the Henscratch Farms winery on this trip, and stopped in two new places on the way there and back. 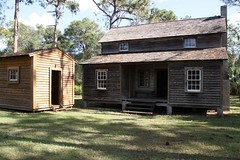 On the way to Highlands Hammock, we stopped at the Florida Natural Grove House Visitors Center in Lake Wales. This is the visitors center for the Tropicana juice processing plant that sits on US 27. And on the way back, we stopped at Webbs Candies in Haines City. Webbs used to have a number of billboards on US 27 that said “Goat Milk Fudge.” Before they cleaned up 27, approaching the goat milk fudge place was like approaching South of The Border on I-95, you knew you were getting there. November and Thanksgiving brought a return trip to James Island County Park in Charleston, SC. Once again we ran the Charleston Turkey Trot and had a great time. We made a non-RV trip to Pensacola to celebrate CurbCrusher’s paternal grandmothers 100th birthday. This was follwed by a New Years RV trip to Lake Griffin State Park near Leesburg. This is only about an hour from CurbCrusher headquarters, and during the trip Little CurbCrusher got ill, so we ended up cutting it short. January brought a new year, and an RV that was listed on RV trader. Early in the month, we headed out to Fort Wilderness again with Little CurbCrusher’s grandparents. 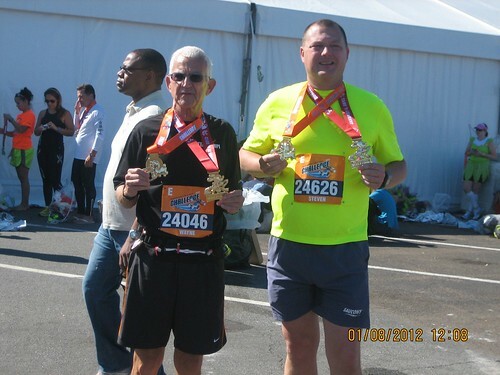 This year, CurbCrusher and his 70 year old father ran the Disney Marathon together. It was a nice camping trip, and a great run. It would turn out to be our next to last camping trip, and everyone had a great time. Photos from can be found here. Our last camping trip was to Reed Bingham State Park in Georgia. This was a nice relaxing camping trip, as there was not a lot to do at Reed Bingham. Right after we got back from trip, we ending up selling the motorhome to a nice family from North Carolina. So, on March 1st of 2013, we said good-bye to our Itasca Sunova 35J. We owned and used it for for almost five years (we picked it up April 15th, 2007). During that time we traveled a total of 32,526 miles using 4,893 gallons of gas and spending 288 nights in the motorhome, traveling through 23 of the 48 contigious states. All in all a great experience. If we were going to be able to make some more long trips like our 2010 trek through the west, we’d probably have kept the motorhome. But Little CurbCrusher is getting bigger and busier and Mr. CurbCrusher is getting busier. It was getting harder and harder to schedule long trips. We were wore out going to the parks that were withing a 3 – 4 hour drive of CurbCrusher HQ, so we figured it was time re-allocate our recreation dollars and change the way we do vacations. Look here soon for our first great post-RV trip report to be posted soon. The last time we went skiing was in 2009, and Lady CurbCrusher was getting antsy. So we decided that we should take a month off from camping and head out west. After our last experience at Keystone, Colorado, we decided that we’d try going back. Of course having a free ticket on Southwest Airlines helped narrow down the destinations. Orlando to Denver is a non-stop flight option, and as we learned last time getting from Denver to the Keystone is not too difficult. 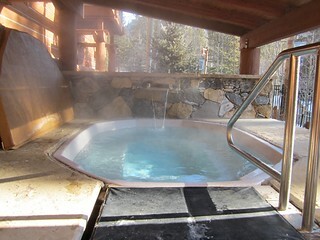 We found a condo in the Jack Pine complex located in the River Run area of Keystone through Summit Cove Properties on the web. This was the same property company that we used last time, and they made it very easy to select them again. After looking through their properties on-line, I called to make some specific inquiries and found out they had a special discount for returning guest. That basically made what was a good value, an excellent value. Well, you are in the Colorado Rockies, so this means skiing. We skied every day at Keystone, and took one day to head over to Arapahoe Basin, which is only about four or five miles from Keystone. Since we planned the trip to A-Basin this year, we spent more time and explored more of the terrain there. Nice wide runs there make it a pleasant place to ski. The last day there, Little CurbCrusher and I tried snow boarding. I have always been jealous of snowboarders because of the comfortable looking footwear they have versus skiiers. So we signed up for a half day lesson and I learned to love my ski boots. I think a half day is to little time to try and learn to snow board, I think a full day would have been needed to get to the point where we would have been able to navigate down the bunny slope. I’m glad I tried it, but I think I’ll stick to skis. Little CurbCrusher on the other hand thinks she would like to try snowboarding some more. One of the evenings we went Tubing at Keystone. Keystone has tube runs that are iced down, and very steep. The ride probably last 20 – 40 seconds, but you are moving. 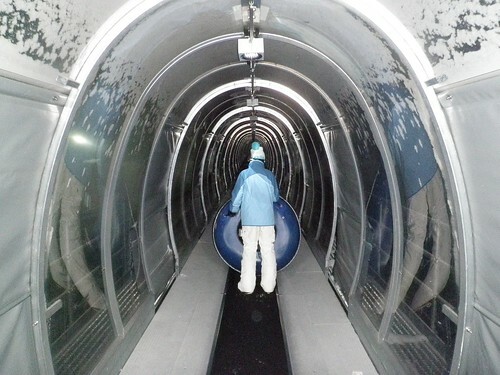 Then you get to ride a “magic carpet” lift back to the top. We probably got about eight or nine runs in during our hour on the tubing hill. There are also a couple of lanes where you can go down up to five at a time. It was a blast whether you went down tied to someone else’s tube or by yourself. Finally, one night we went on a sleigh ride to dinner. It was nice, but cold. We gathered at the Keystone ice rink, and then rode an old bus over to a place where the horses and sleigh were waiting. It was about a thirty minute ride to the cabin where dinner was served. After dinner, a cowboy sang some songs and then we bundled up for the trip back. Equipment Rental — We rented our skis from Mountain View Sports in Keystone again. They were a short drive from the condo and their prices were great, about 40% off what we had seen online at the other places located at Keystone. The skis we got this time seemed much better than the one’s we had gotten on the previous trip, and when Little CurbCrusher and I wanted to swap out skis for snowboards for the last day, they were very accommodating. Well, we all get older each year, or at least hope we do. This year for Mr. CurbCrusher marks 49 of them on the planet, and Lady and Little CurbCrusher decided that birthdays are about experiences. 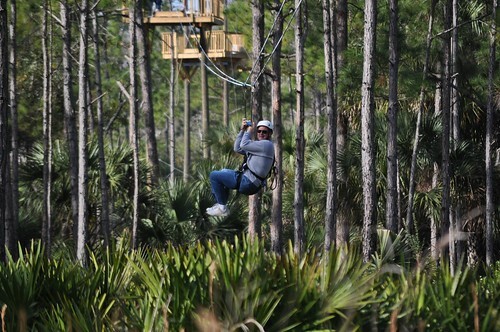 So for my experience I choose to go zip lining at Forever Florida. Forever Florida is a chunk of real Florida located on US-441 between Holopaw and Yehaw Junction. It takes a few minutes to drive out there, but it is worth it. Our trip was during the middle of week in the middle of January. A great time to avoid crowds, as we were the only three people on our zip line tour. It starts with you getting kitted up in a harness and helmet. Your guides then take you to a large tower and up you climb. You then spend the next hour working your way through the seven zip lines that take you to the ground level. Along the way there are a couple of suspension bridges that you get to cross and you get a view of some large gators as you zip across their habitat. All in all it was a great way to spend a day. Forever Florida has other things to do like horseback riding and a swamp buggy tour. They’ve also opened up the first zip “roller coaster” since we were there. If some one is in Orlando and looking to do something other than theme parks and outlet shopping centers, Forever Florida is and alternative to explore. The photos from our zip lining adventure are in the CurbCrusher Flickr photostream here. Well, Mr. CurbCrusher has let the site get a bit behind the times. So since half the year is gone, lets get some post in place and try and catch up. After our New Years camping trip, we packed up the RV for the long trip to Walt Disney World and the Fort Wilderness campground. This is our umpteenth trip to Fort Wilderness, but this time was a bit of a special trip, a fitness trip if will. First the cast of characters was expanded for the trip. In addition to Lady, Little and Mr. CurbCrusher, we had Grandmother and Grandfather CurbCrusher, Uncle CurbCrusher 1 and Aunt CurbCrusher 1 and Uncle CurbCrusher 2 and Aunt CurbCrusher 2. And everyone was doing some sort of activity during the Disney Marathon weekend. So Friday morning we were all up early and headed to the 5K. Because CurbCrusher is just downright awful at finding people running and taking pictures, there are no pictures of the 5K runners at finish line. There is however, this fine photo of the group after the race with their medallions. Saturday morning, the runners all got up early and headed over to the half-marathon start. For the first time ever, CurbCrusher carried a camera on the run, and got pictures of the stuff that went on during the race. Mr. CurbCrusher and his dad, Grandfather CurbCrusher, ran together, and Aunt and Uncle CurbCrusher 2 ran together. When originally planned, it was supposed to be Grandfather CurbCrusher’s first half marathon. However the trip to Pensacola for the Blue Angels air show had come up and we had all run the half marathon there. 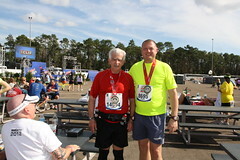 So three weeks before his 70th birthday, Grandfather CurbCrusher ran his second half-marathon with is son, CurbCrusher. It provided a nice three hours of father/son time and we all survived. Sunday morning and two of us, Mr. CurbCrusher and Uncle CurbCrusher 2, are up early to go running again. Since carrying a camera had worked so well for the half-marathon, I decided to carry one for the full marathon too. If you click through above on the Flickr set, I got photos of most all the mile markers and some of the folks along the way. Another six hours of running, this time with my uncle, and we were done. Officially Goofy. Everyone hung around Fort Wilderness until Monday and we had a great family visit, with lots of rest, and eating. After running 39.3 miles, eating is important. 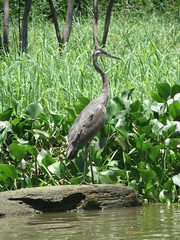 Our last trip to Mayakka State Park was immediately before our Great American Road Trip in March of 2010. On our previous trip we’d done the ranger tours, the airboat ride and the tram tour, so this trip was to have a bit of a different tone to it. We were going to do stuff outside the park. 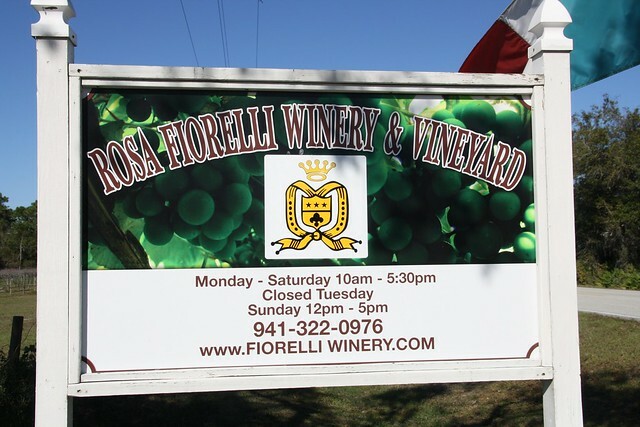 We stated with a trip to the Rosa Fiorelli winery that is located just north of the park. In addition to collecting all the local state park stamps, we’ve also started making sure we drive to every winery within a days drive of the places we camp. This winery was a pleasant place, don’t ask me about the wine, I don’t drink it, that’s Lady CurbCrusher’s job. The folks that ran this place were friendly and jovial, and that made the stop pleasant. The shop was small, and had about 10 people in it, and only room at the tasting bar for 2, so it made for an intimate wine tasting. Our next stop was Hunsader Farm, which we passed on the way to the winery. This was a cute, kitschy kind of place with a produce stand, petting zoo and other activities. 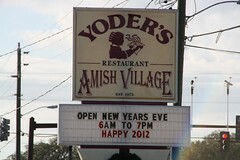 Finally it was time to eat, so we headed into Sarasota to Yoders Amish restaurant. Lady CurbCrusher had heard about this place, so we decided to try it out. They are famous for their pies, but all the food is excellent. The line was out the door when we got there around 3:00pm, and we when left about ninety minutes later, the line was around the side of the building. We indulged in large high cholesterol meals of country fried steak, fried chicken and mashed potatoes and gravy. Then topped it all off with pie for desert. We had apple, peanut butter cream and pecan pie. All the food was delicious and the portions were generous. It was definitely worth the wait. The next day we headed out to a farmer’s market that we’d seen on the way out the back entrance to the park the day before, and found much more. 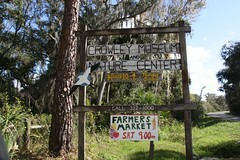 It turned out it is the Crowley Museum and Nature Center. In addition to the farmer’s market on Saturday morning, they have a local history museum and a nature trail that wanders through the area. If you are a first time visitor to the farmer’s market, they will give you a free ticket to the museum and nature center. Always looking for free stuff, we took advantage of the offer and spent an hour or so looking through the exhibits and walking the nature trail. The exhibits were a good representation of the local history and very informative. 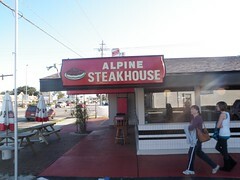 Our final activity for the trip was to eat at the Alpine Steak House. 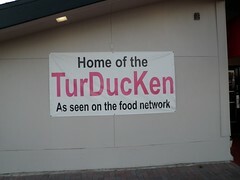 Mr. CurbCrusher had been watching Diners, Drive-ins and Dives a couple of weeks before the trip and seen the Alpine Steak House and it’s TurDuckEn dish featured. Since we were going to be in Sarasota, it seemed only natural to go eat there. There was no line at the Alpine Steak House, so unlike Yoders, we were inside and seated within seconds of arriving. The food was good, but did not live up to the expectations. Mr. CurbCrusher had the TurDuckEn, while Lady CurbCrusher had a chicken, and Little CurbCrusher went with a hamburger. We all enjoyed our meals, but they weren’t anything great. 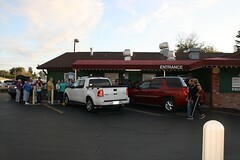 Given a choice, I’d probably make the trip to Yoder’s and wait in line. Way behind on trying to post our trips. It’s February and I’ve got to go back to December to start catching up. After last years trip to James Island South Carolina for Thanksgiving and the Christmas lights there, we thought we’d try something closer to home. So we headed up to the junction of I-75 and I-10 for White Springs, Florida and the Stephen Foster Folk Culture Center State Park. Lady CurbCrusher had heard that they light up the park as a drive through Christmas light display. We arrived on Friday afternoon and the first thing we had to do was put a 100 miles on the car. Lady CurbCrusher has a Florida State Park Passport book, and therefore we need to visit all the state parks and get stamps. So after pitching camp, we headed over to Madison Blue Springs State Park. Where we discovered that the State of Florida has sucked all the fun out of the park. 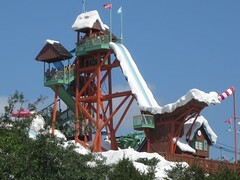 We had visited here in 2008 and had a blast jumping into the water and swimming. However, some time in the intervening three and half years, the state has removed the jumping platform. It’s ashame because Madison Blue Springs has always been fondly remembered as one of the great days of fun we had camping, and a place we’d looked forward to going again. Alas, no more. We also stopped by Suwannee River State Park and collected Lady CurbCrusher’s stamp before heading back to Stephen Foster. Back at Stephen Foster we had a nice dinner, and the headed out to walk around the park. We walked down to the craft village where most of the activities were taking place. There was a funnel cake concession, free popcorn and hot chocolate. Santa was wondering around, and all-in-all a festive Christmas atmosphere was to be found. All the craft houses were decorated, as was most of the park. This included the bell tower and its surrounding area, where they were making it snow every hour. 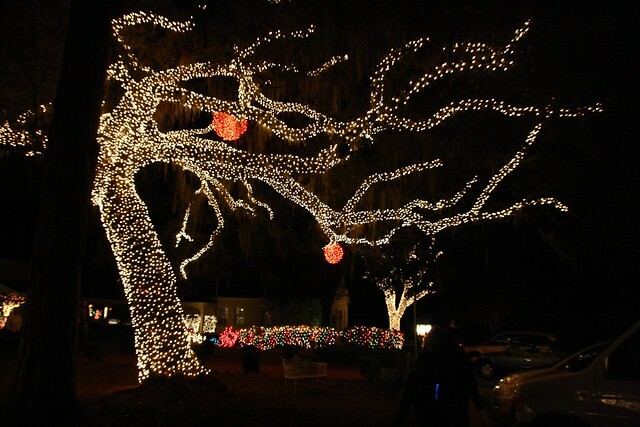 While it was not as large as the James Island light display, it was a large light display, and much more pedestrian friendly that the Charleston park. We spent a good bit of time on both of our nights in the park wandering around the lights.